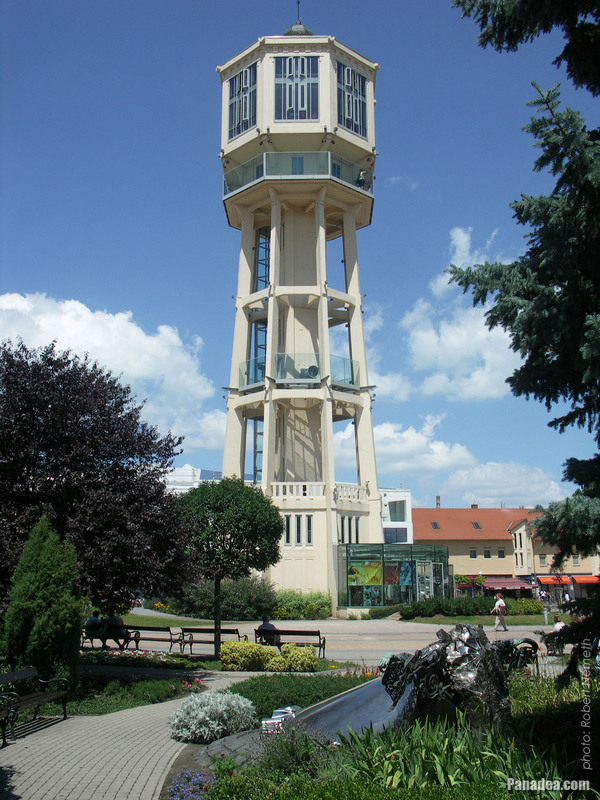 The original water tower was built in by the plans of Jenő Gergely and Árpád Gut in 1912, and the transformation of the building to a lookout tower was completed exactly for its centennary. 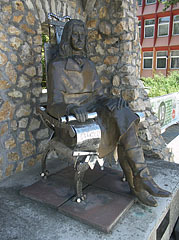 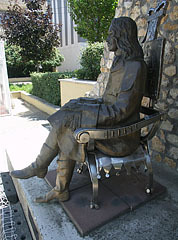 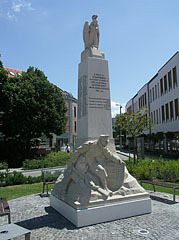 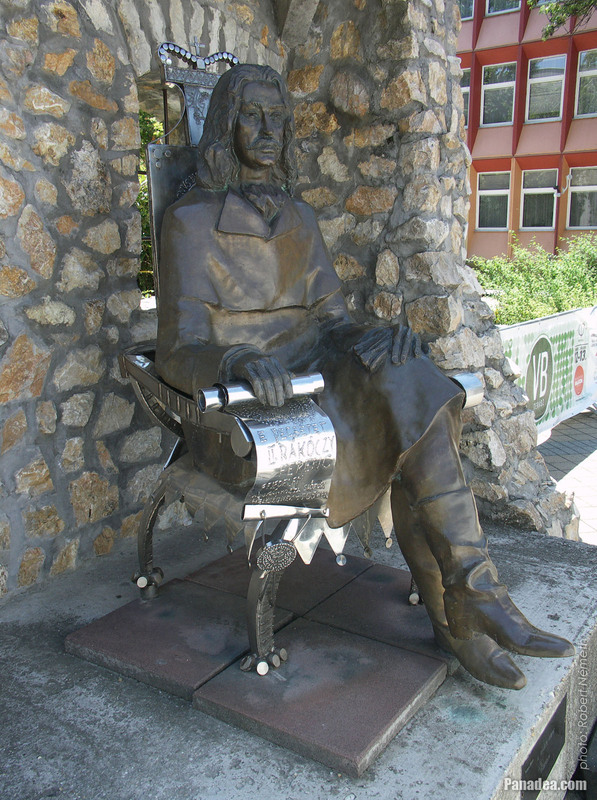 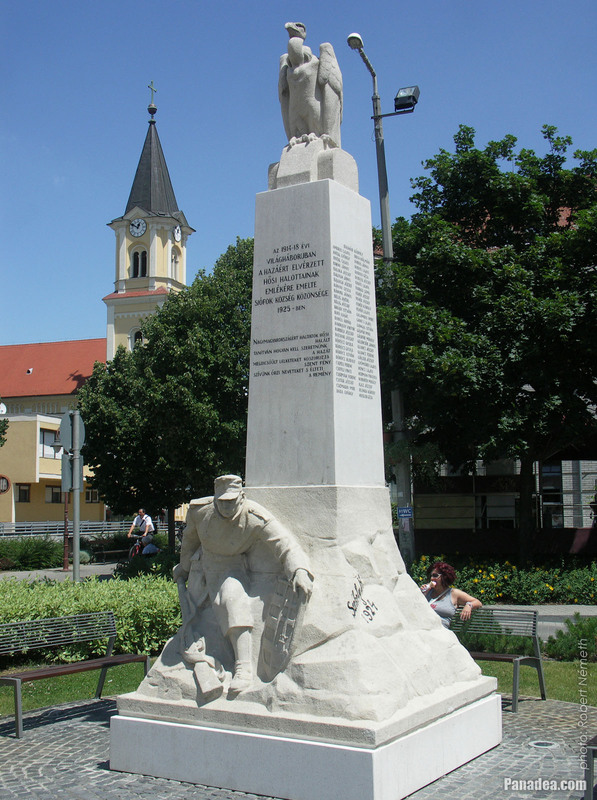 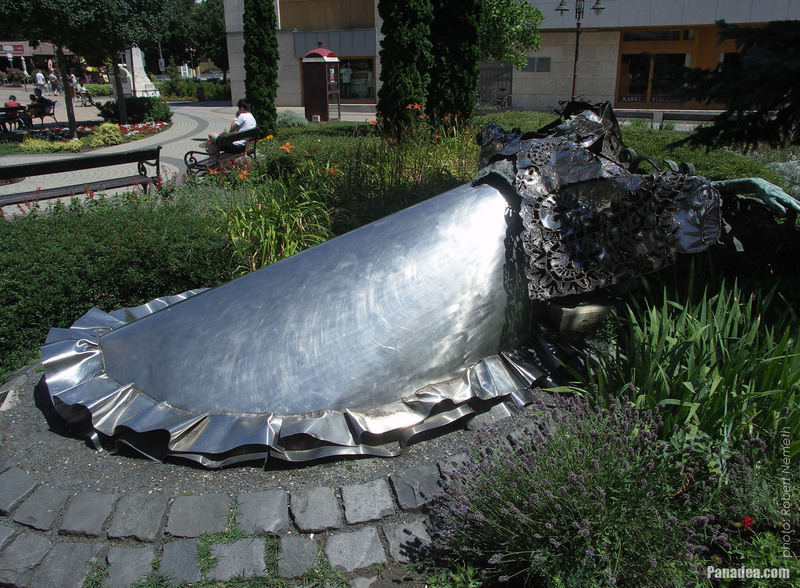 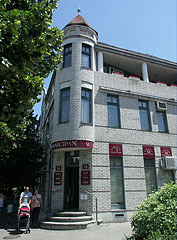 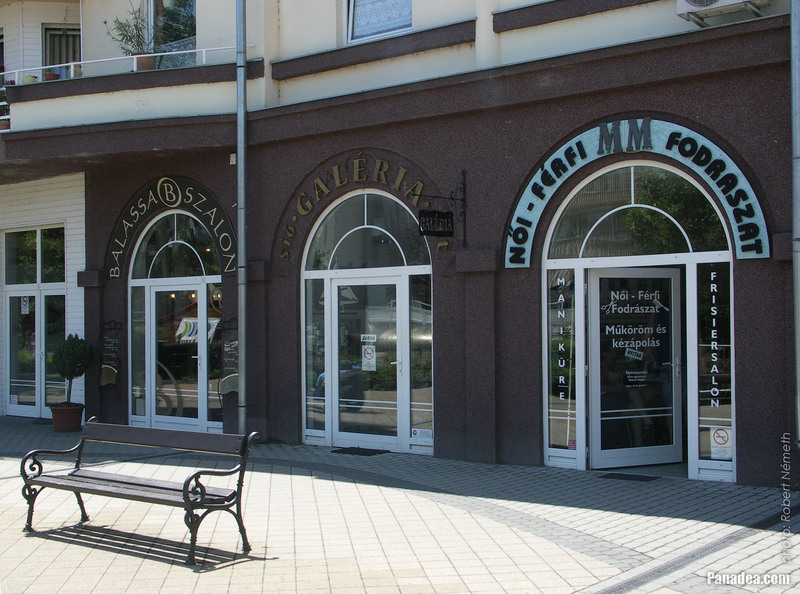 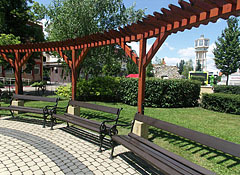 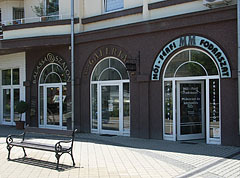 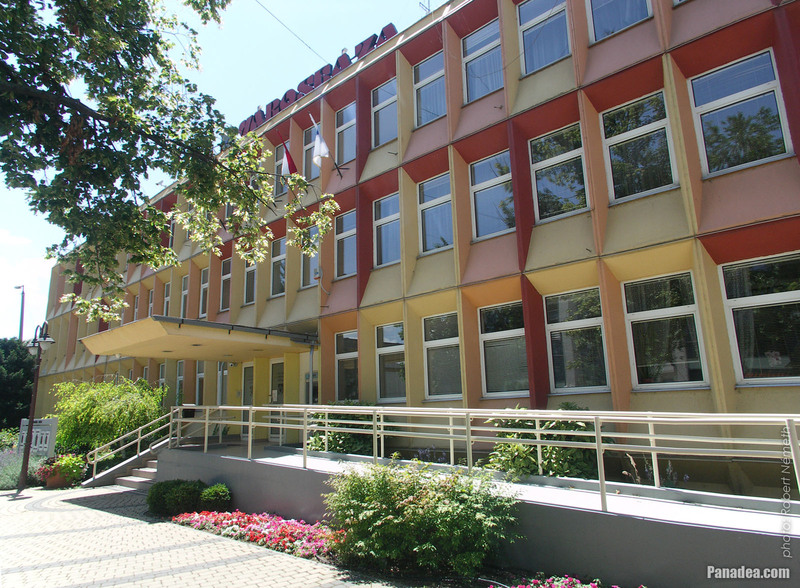 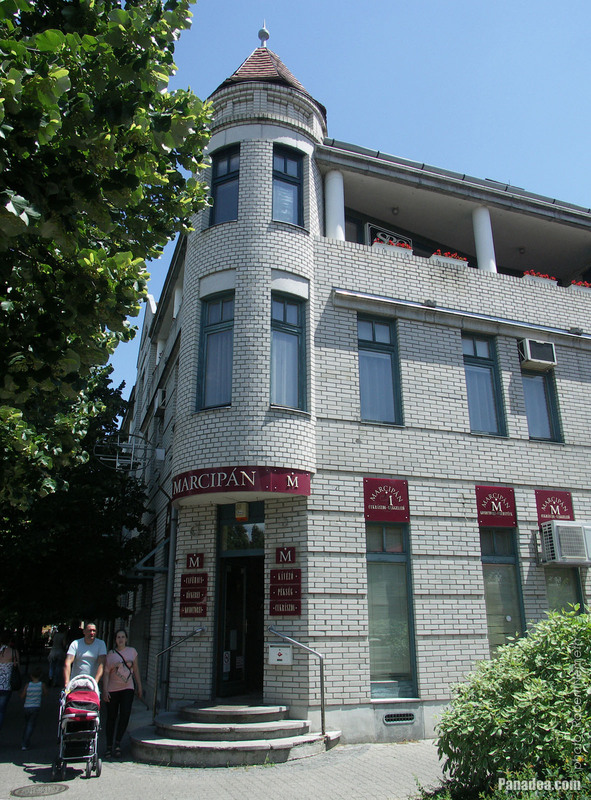 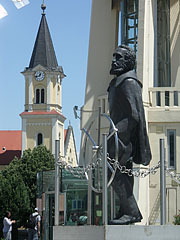 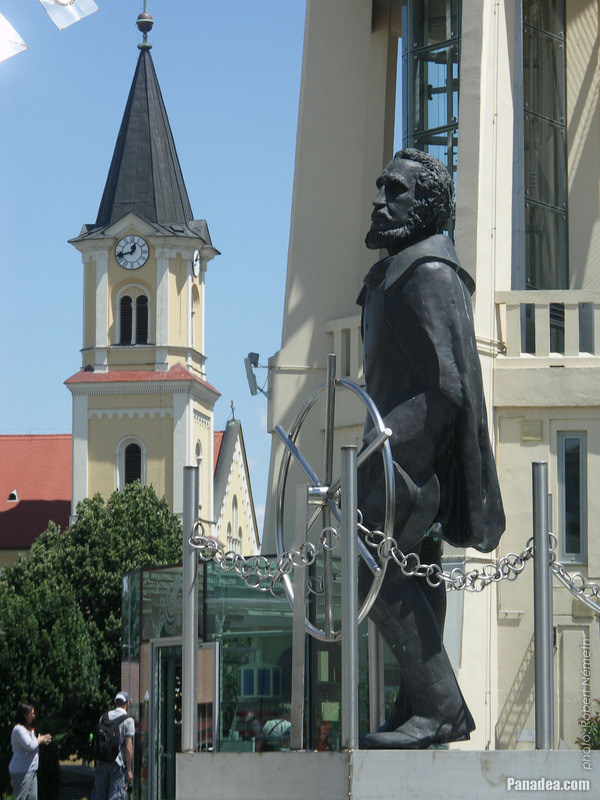 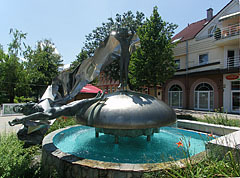 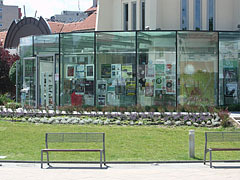 Created by Imre Varga in 2003, it is a copy of his earlier work from 1989, that stands in Mezőberény. 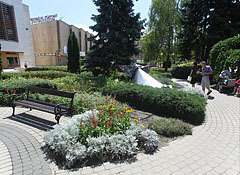 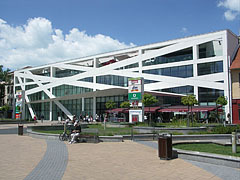 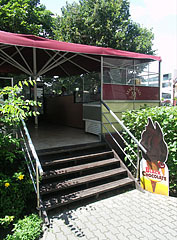 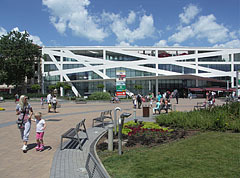 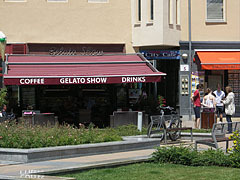 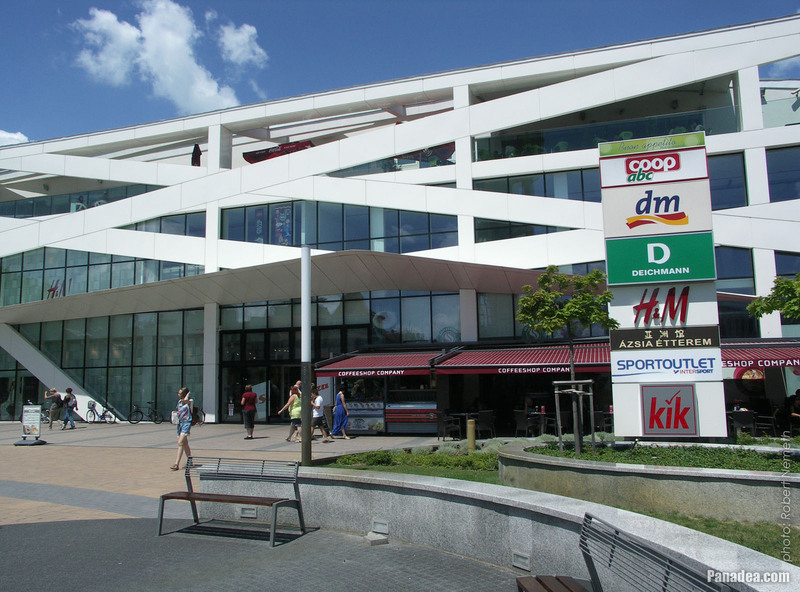 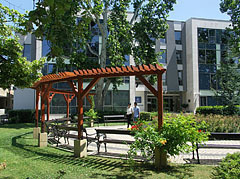 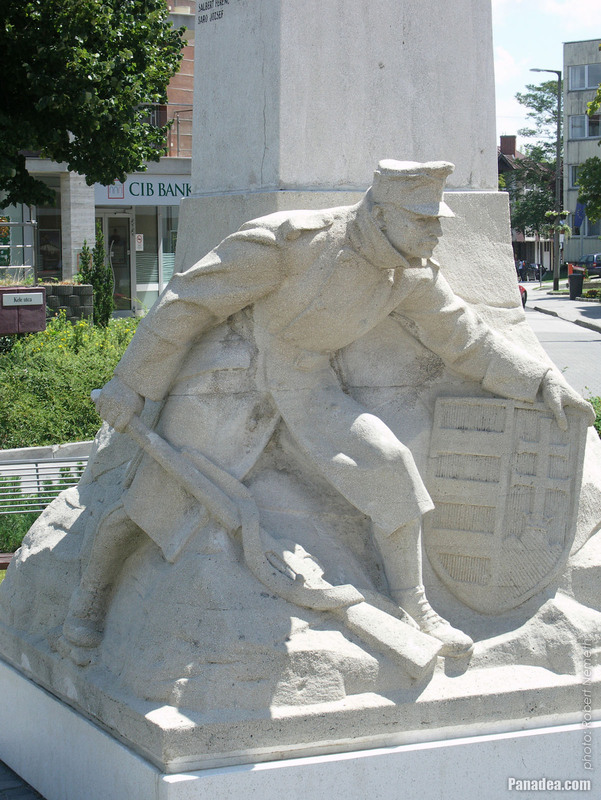 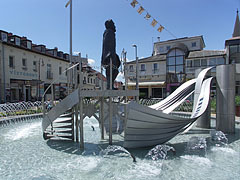 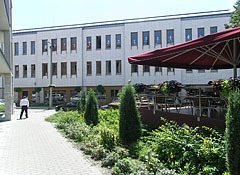 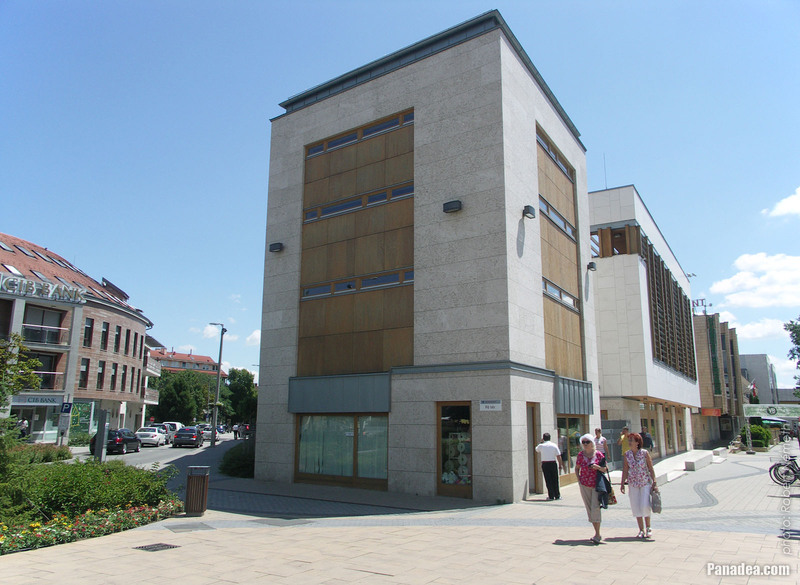 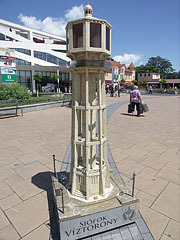 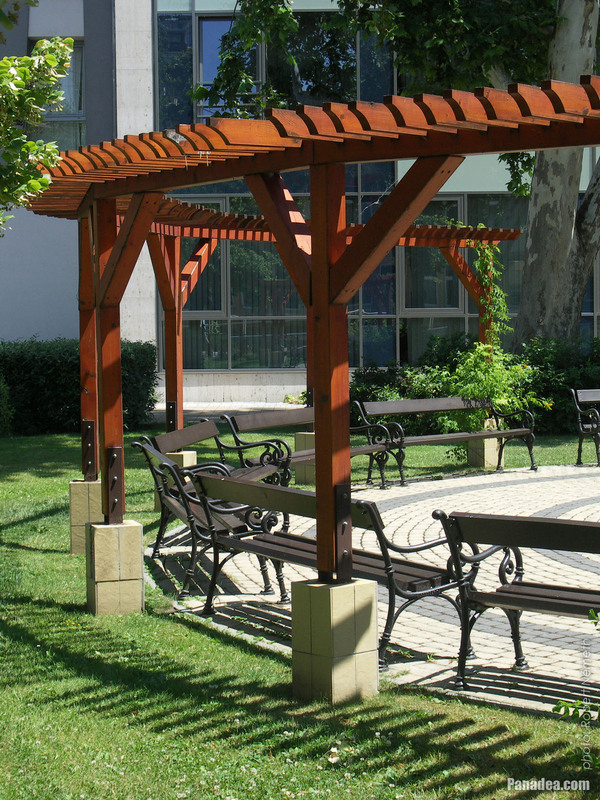 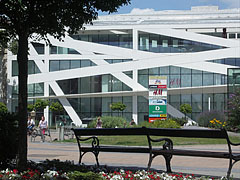 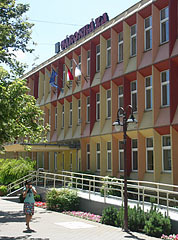 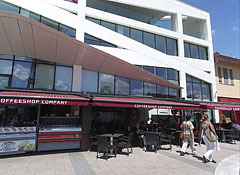 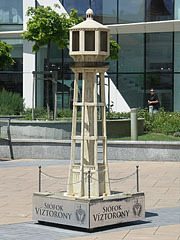 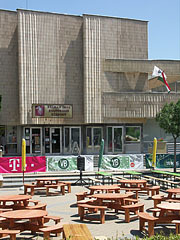 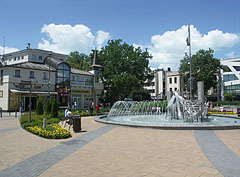 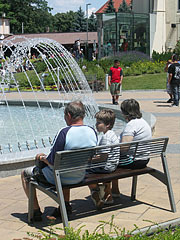 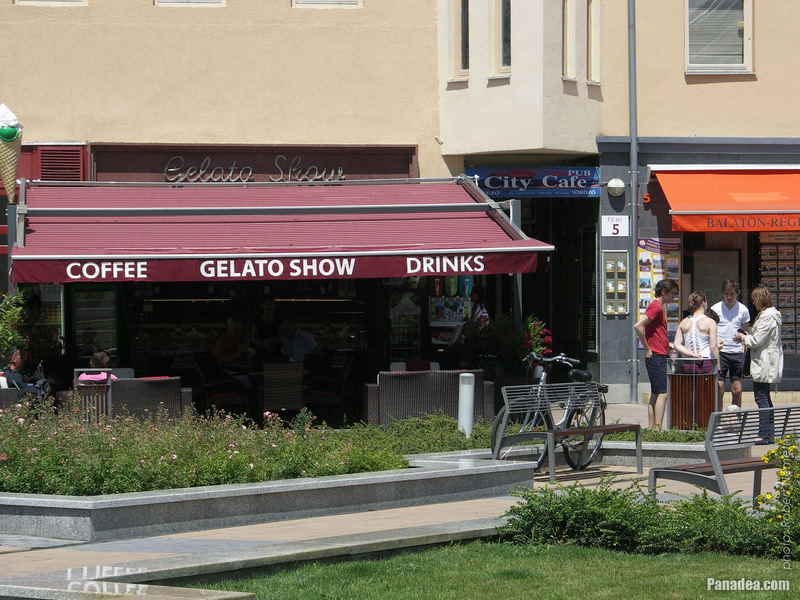 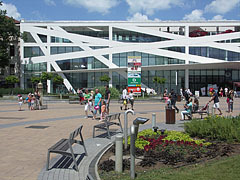 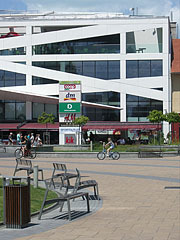 It stands on the site of the former Sió Shopping Center that was demolished in 2008. 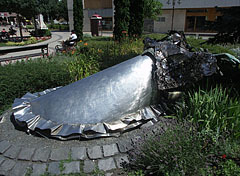 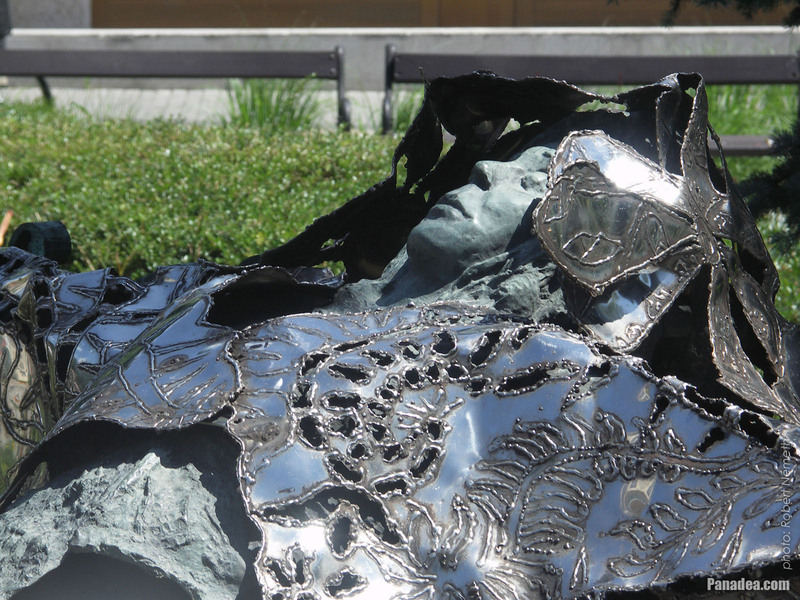 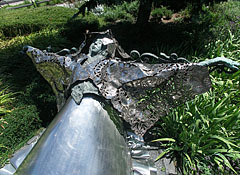 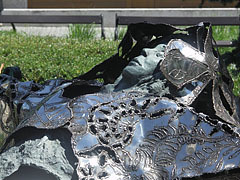 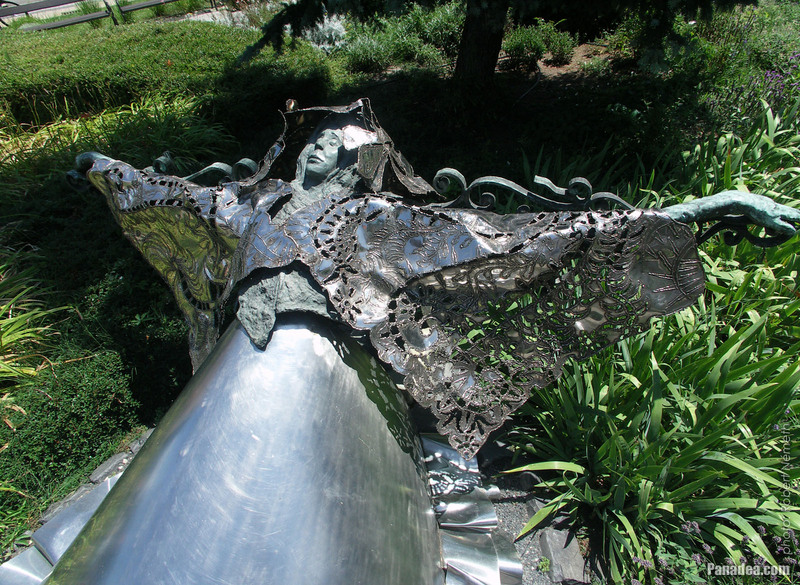 With this artwork Imre Varga sculptor refers to the poem of the French poet Charles Baudelaire namely "The Carcass" or "A Carrion" (Une Charogne). 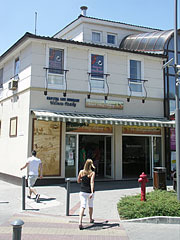 Also there's a clothing store downstairs in the building. 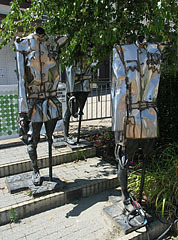 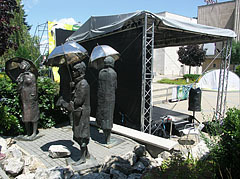 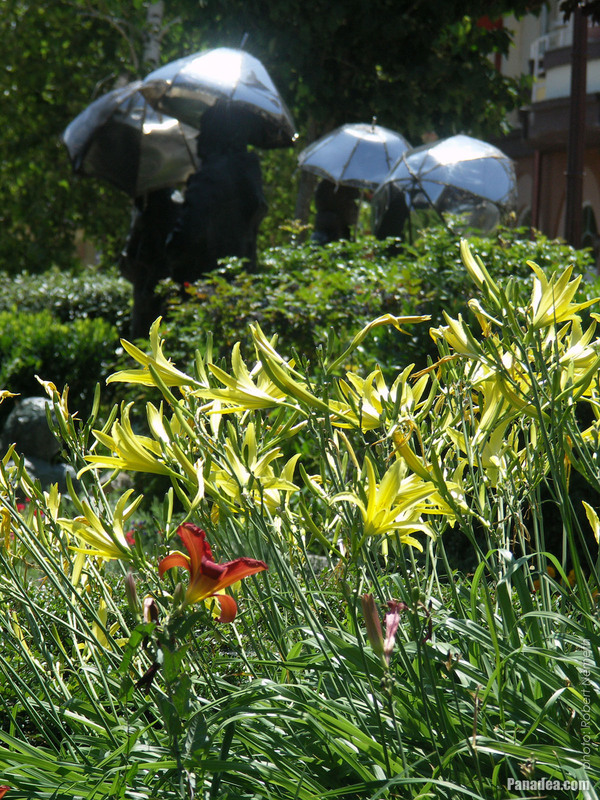 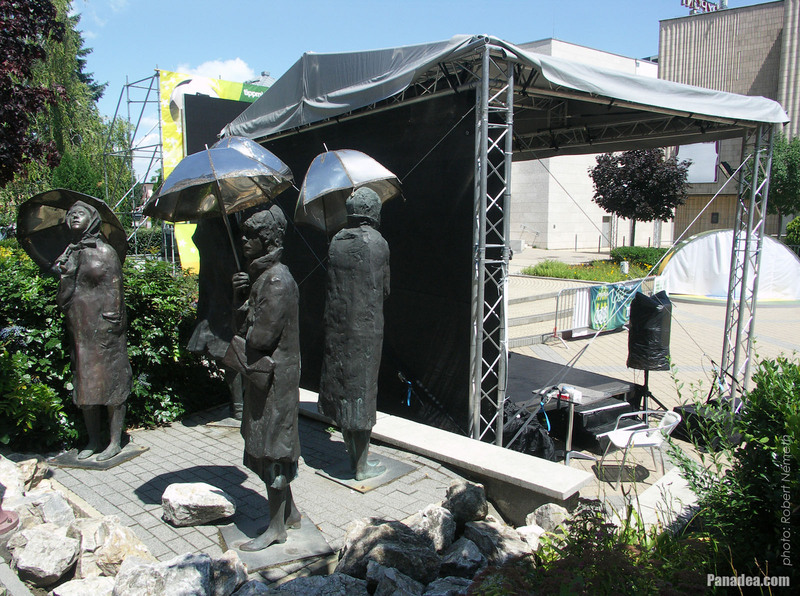 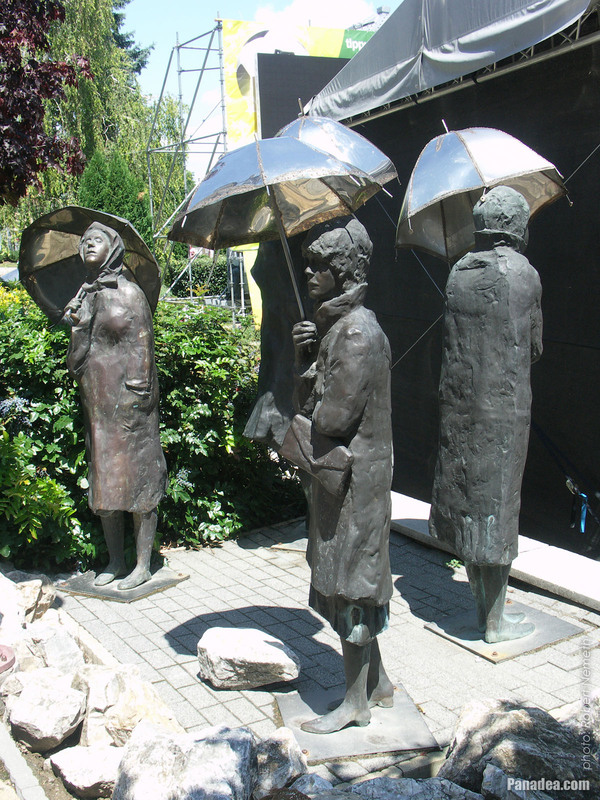 Created by Imre Varga in 2003, copy of his statue group that stands in Budapest 3rd District since 1986. 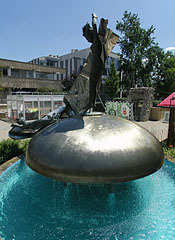 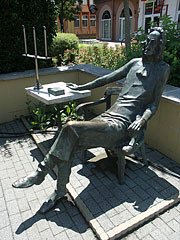 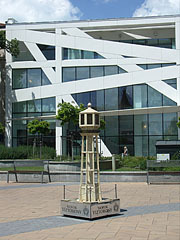 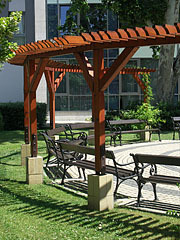 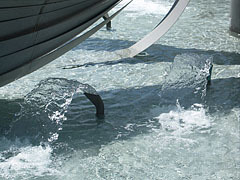 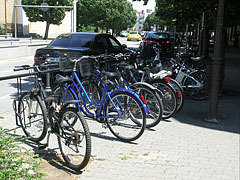 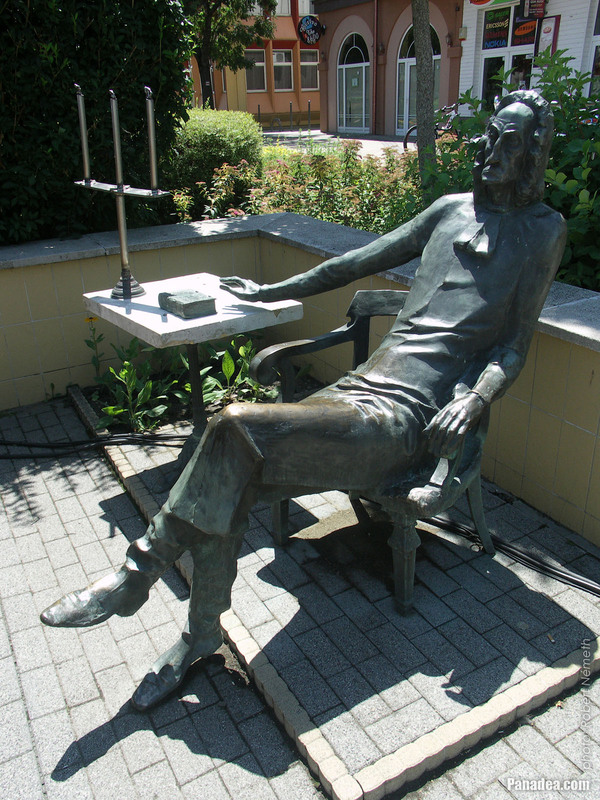 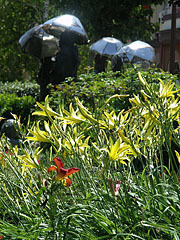 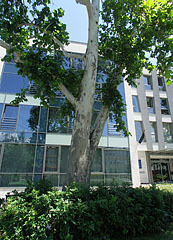 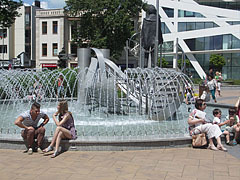 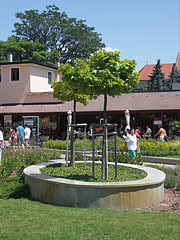 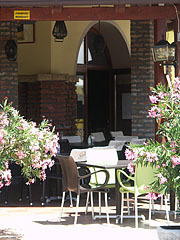 Created by Imre Varga in 1988, stands here since 2005. 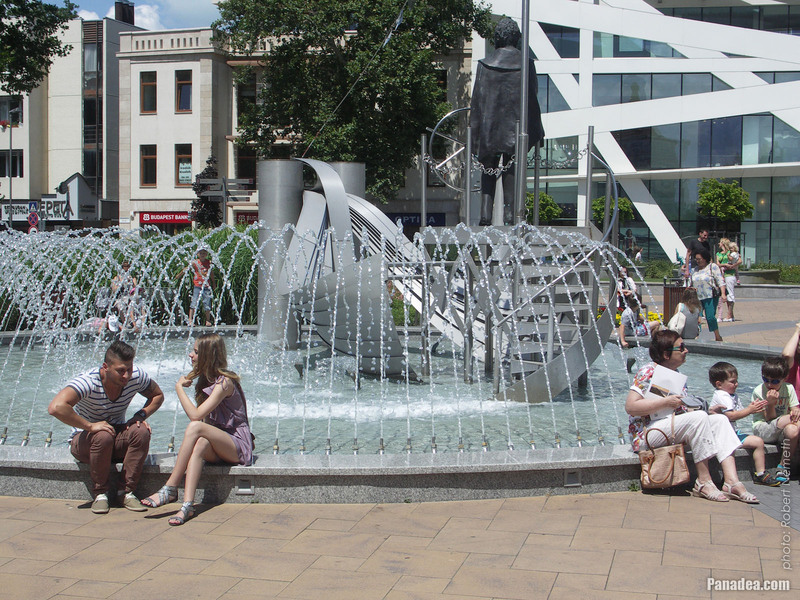 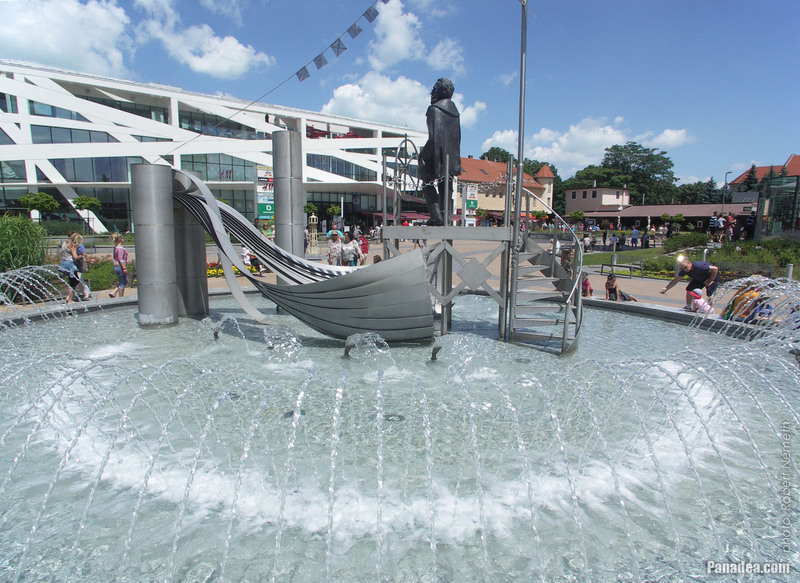 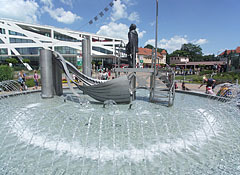 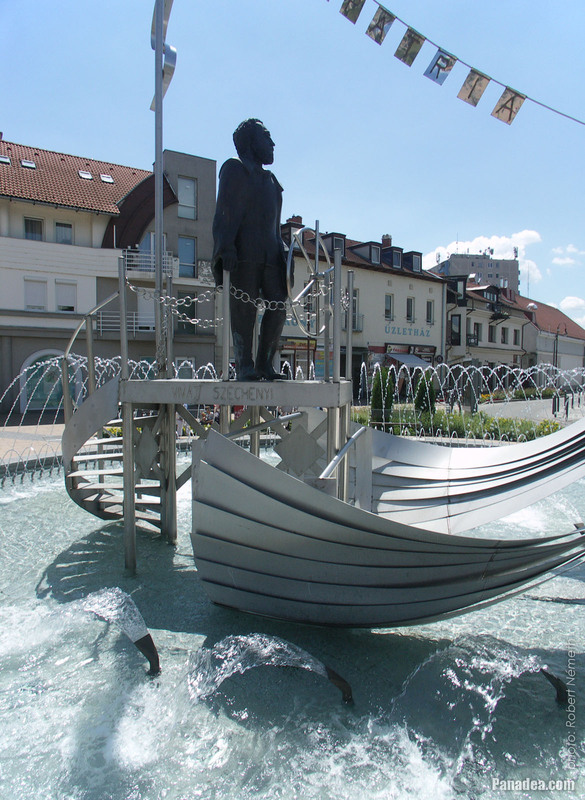 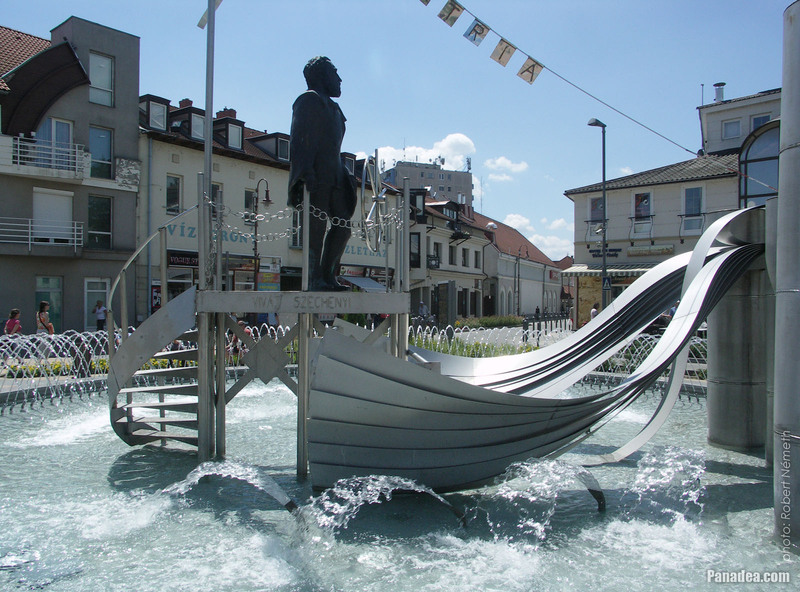 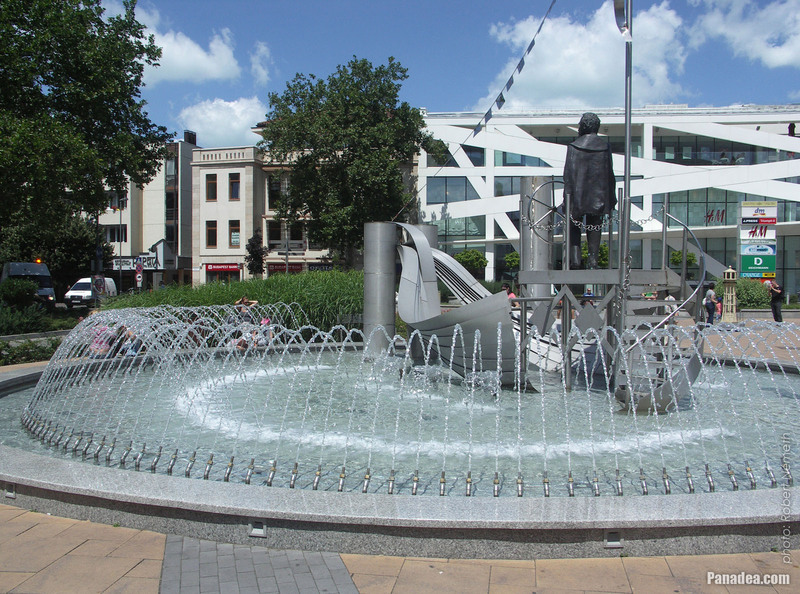 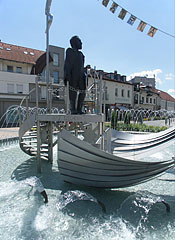 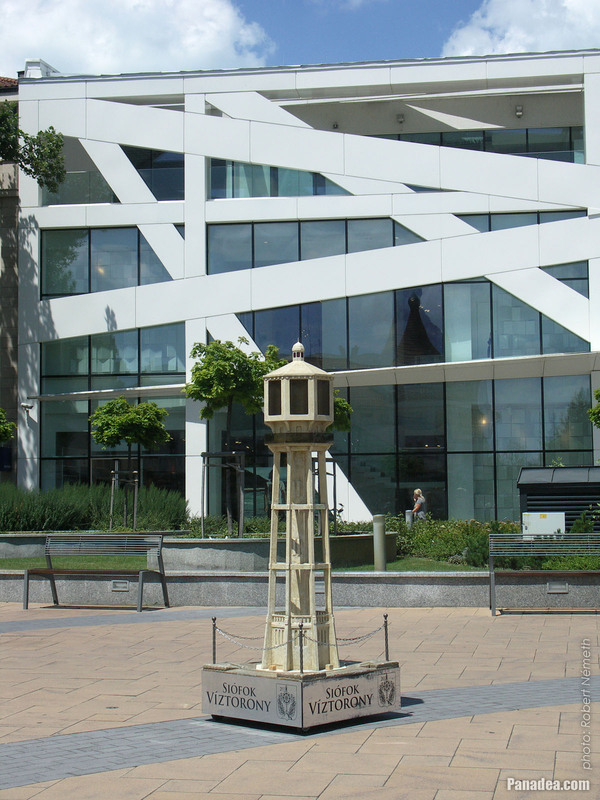 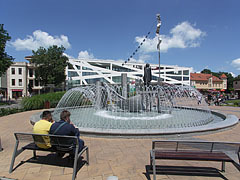 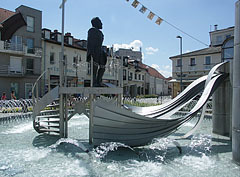 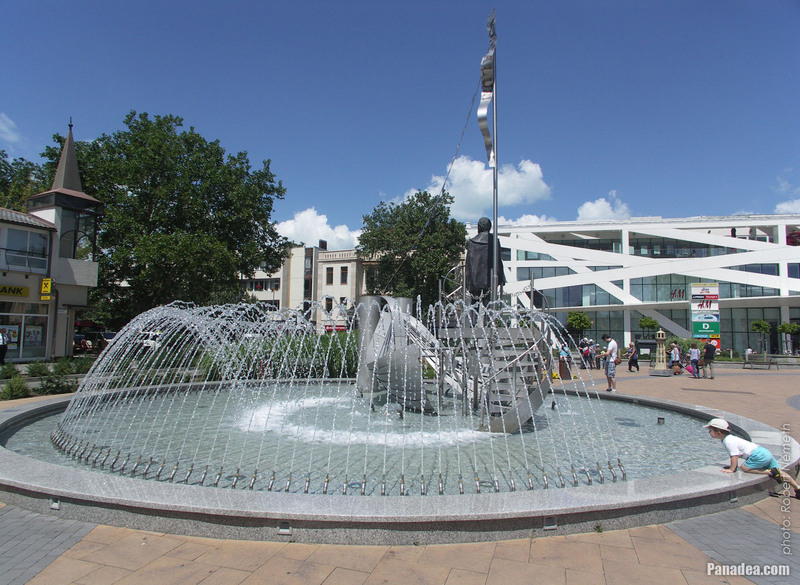 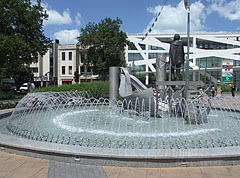 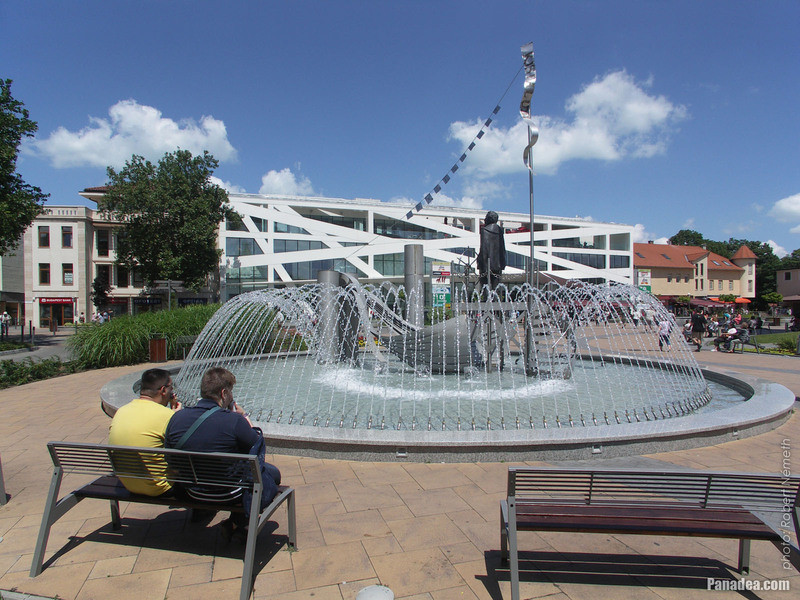 It is a replica, made by Imre Varga based on his original from 1971 that stands in Debrecen, in addition there's another copy in Antwerpen, Netherlands. 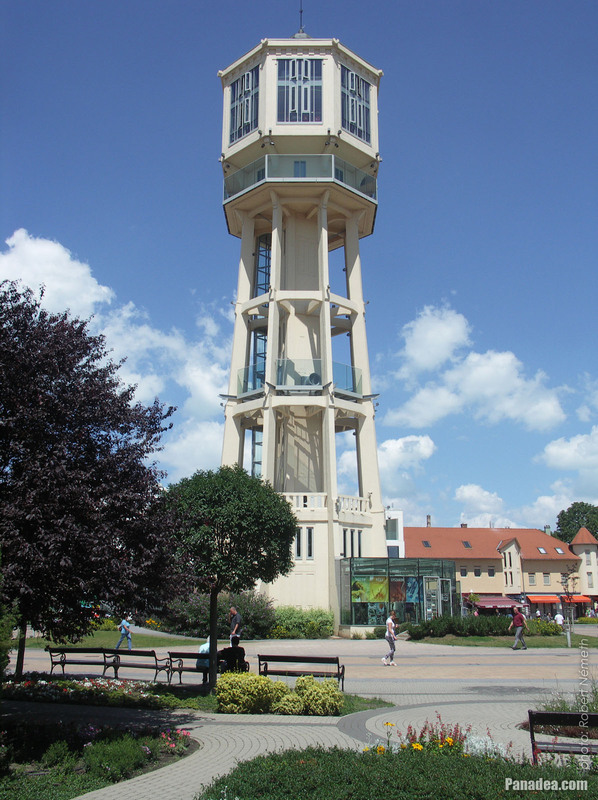 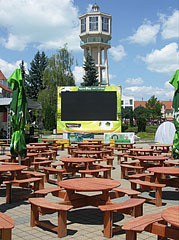 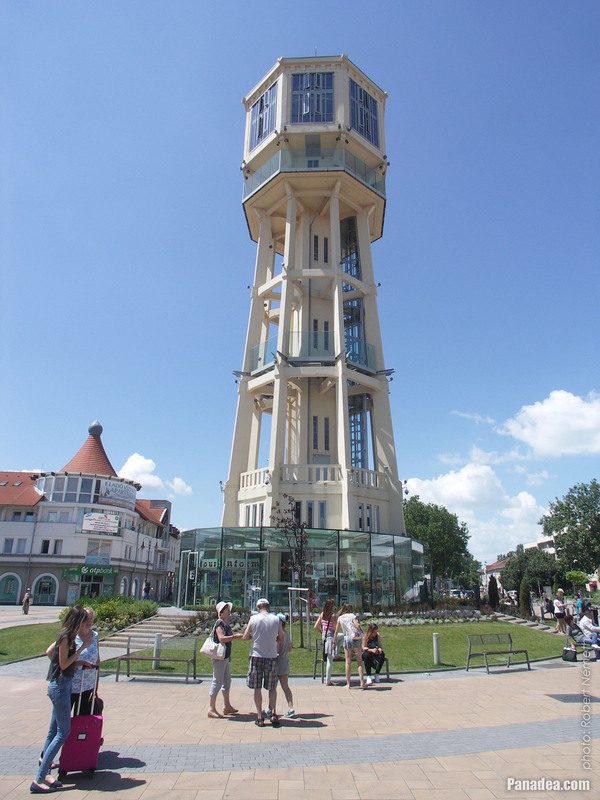 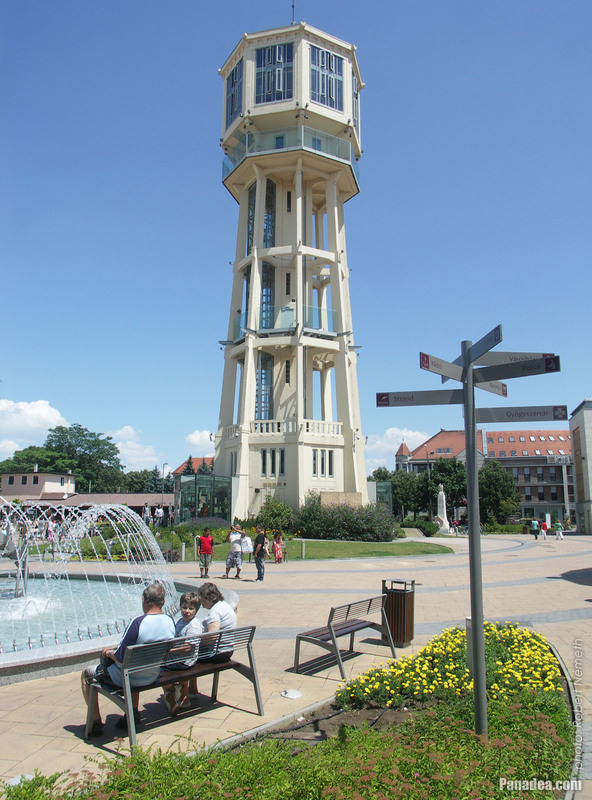 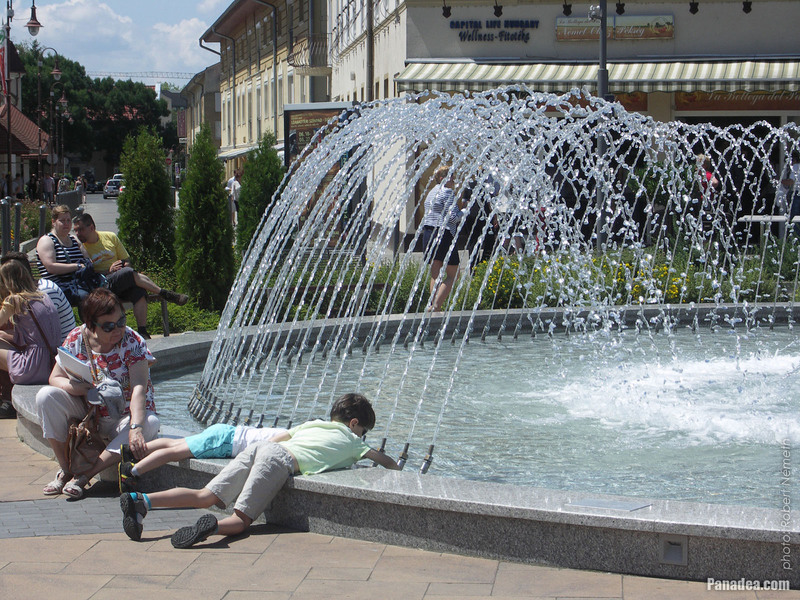 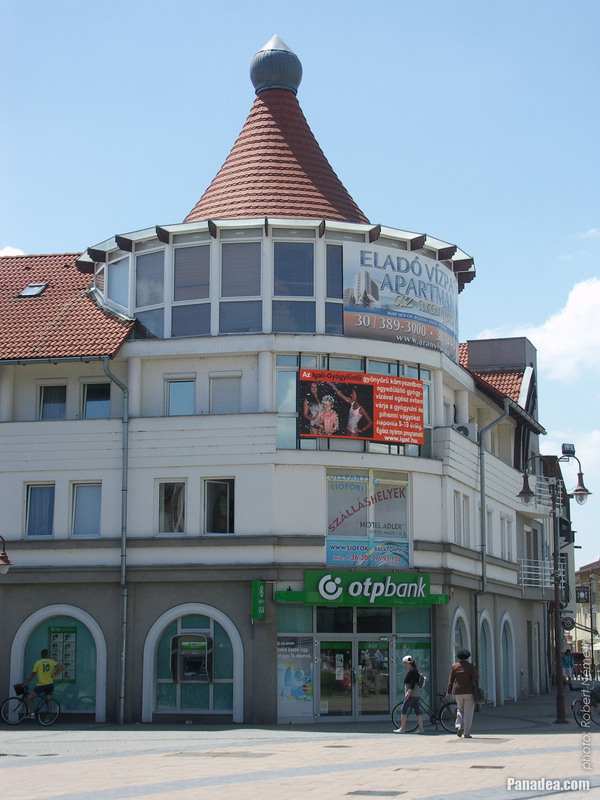 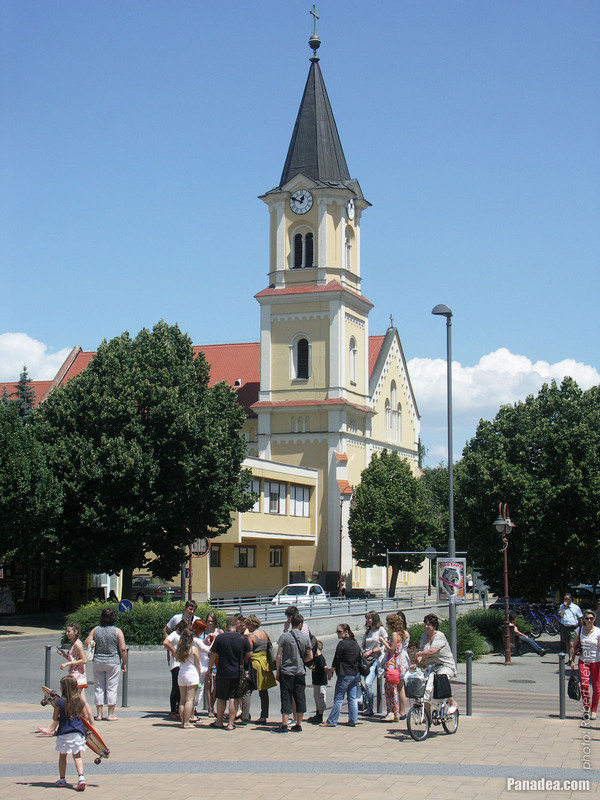 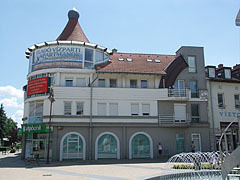 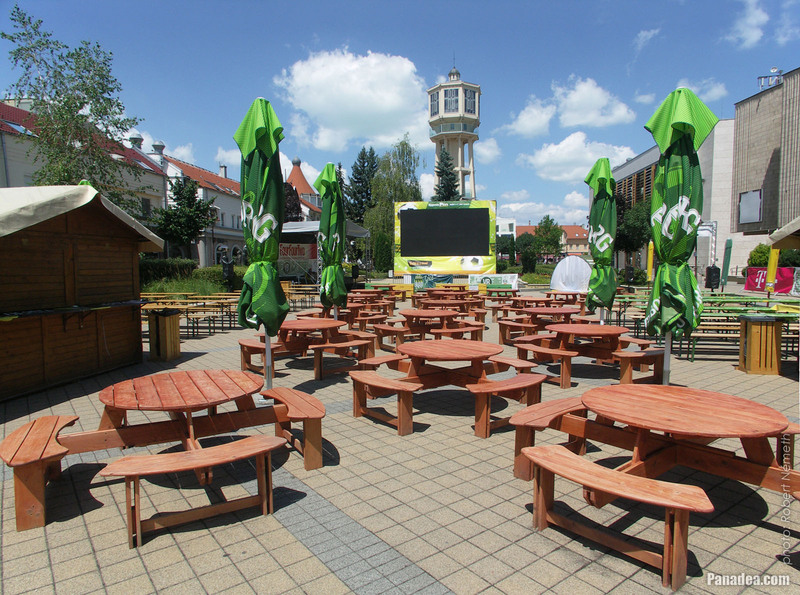 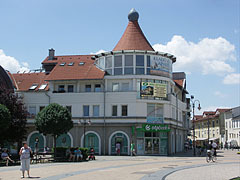 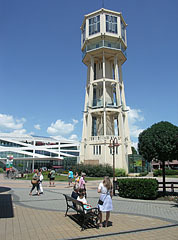 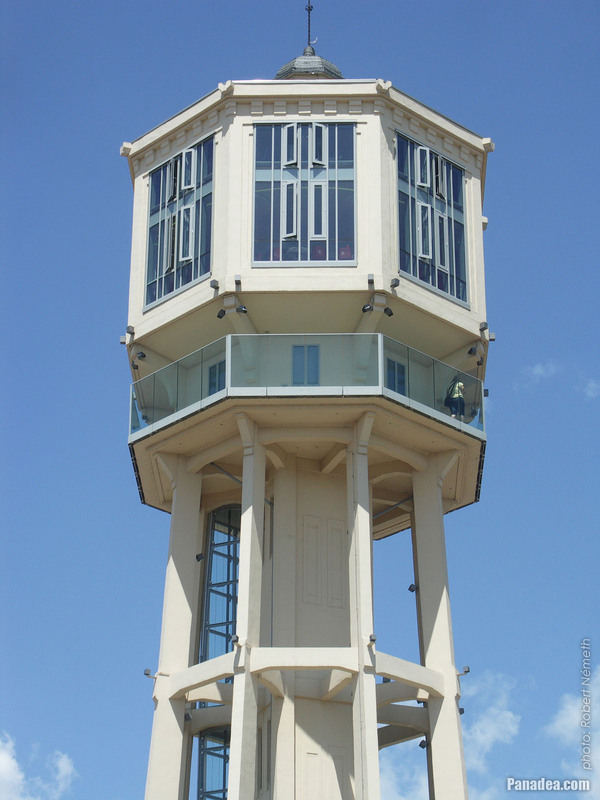 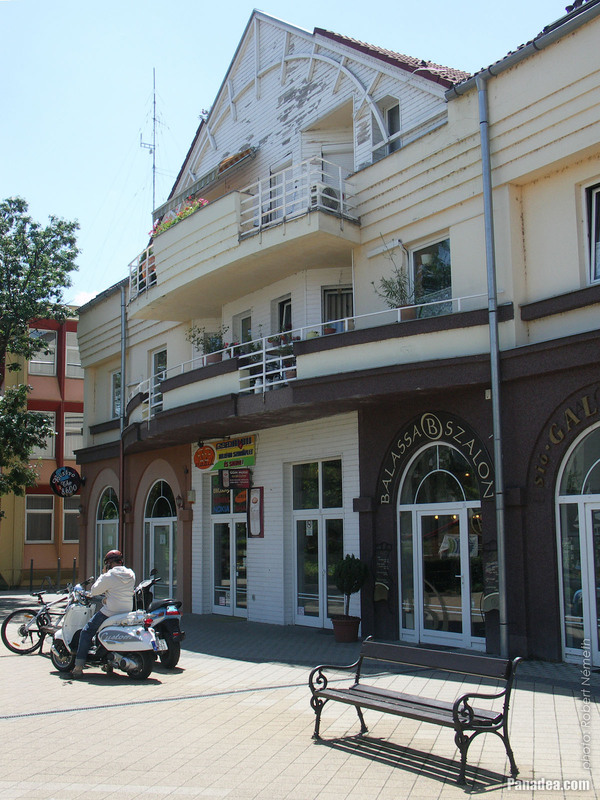 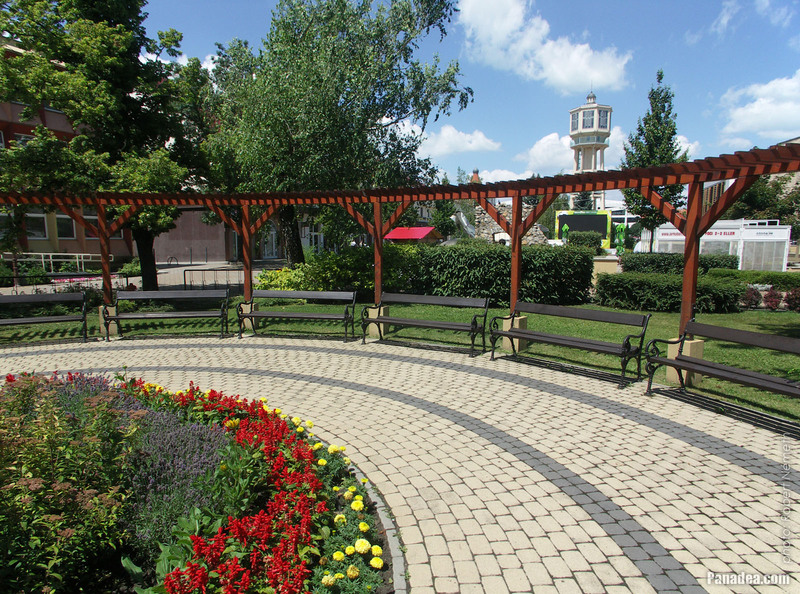 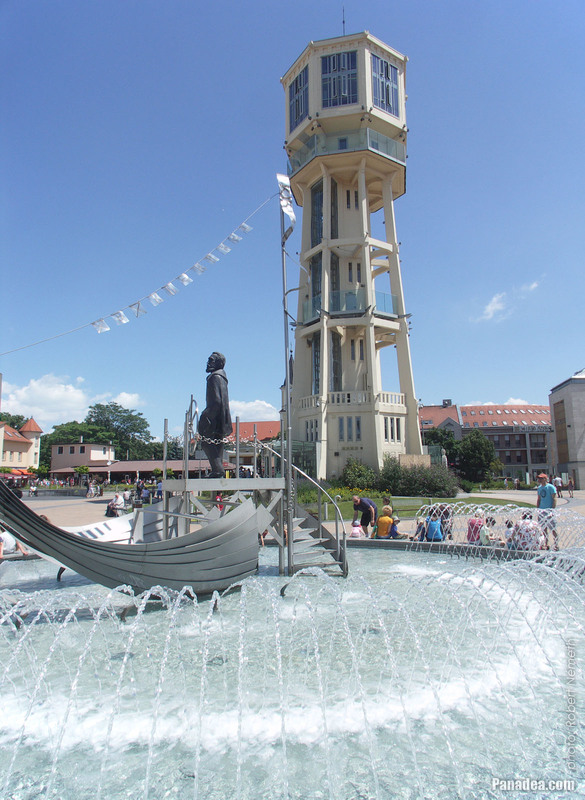 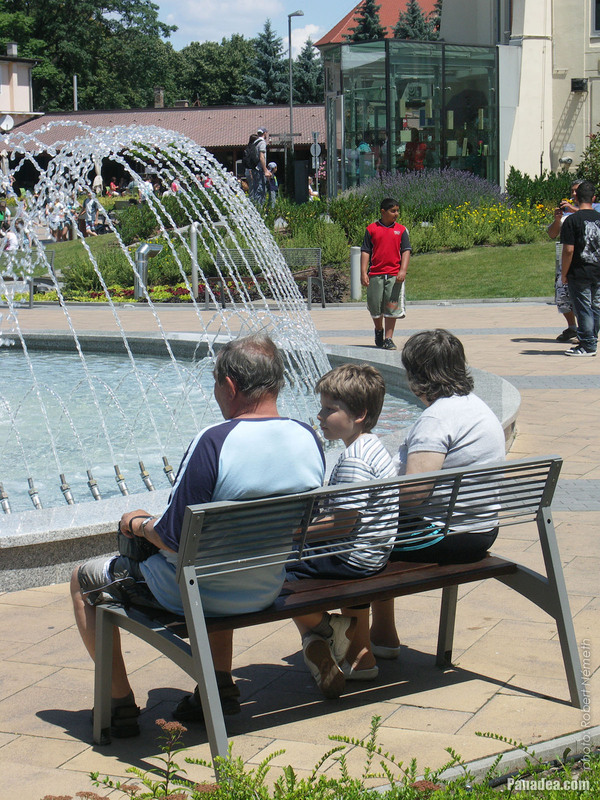 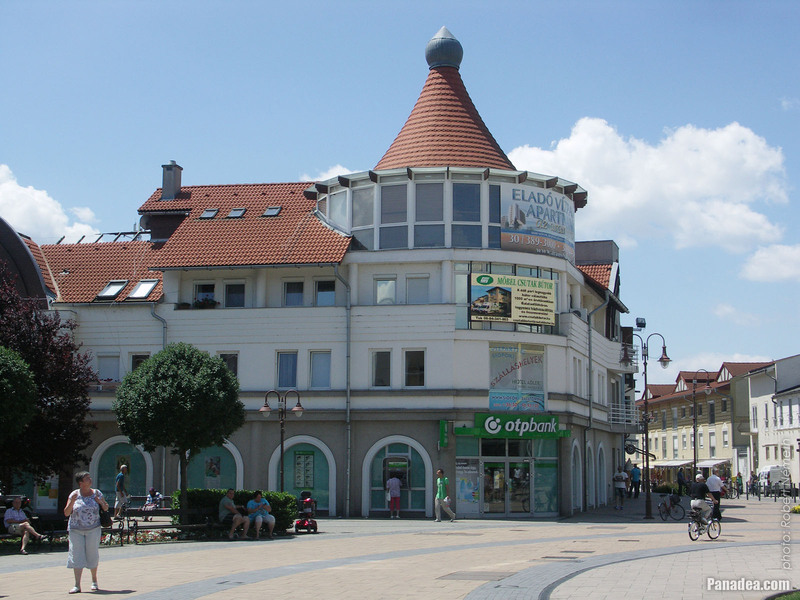 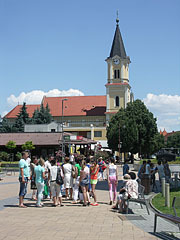 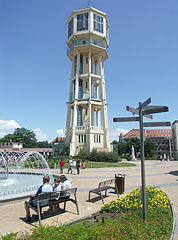 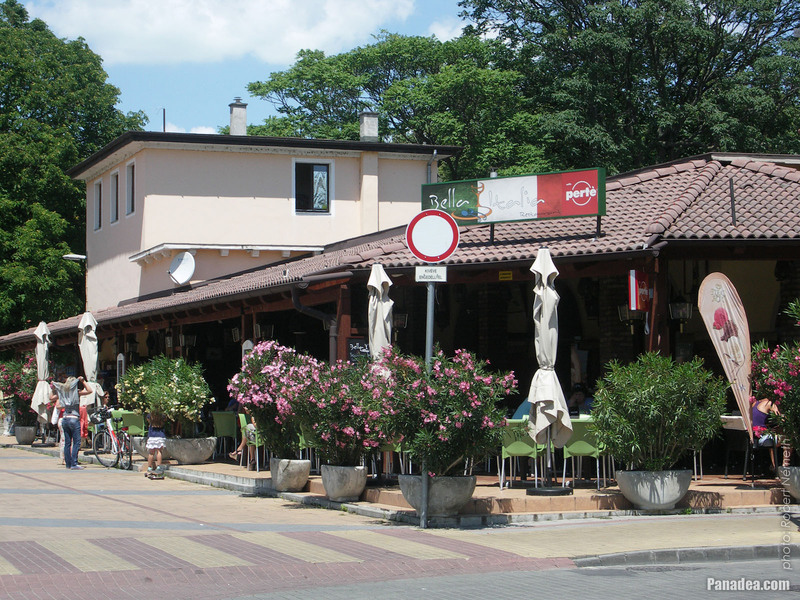 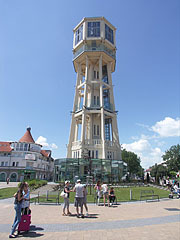 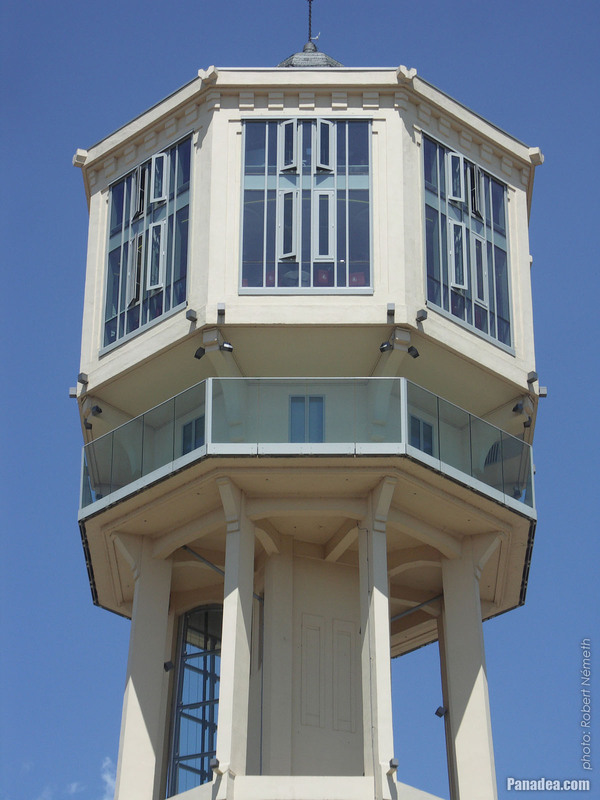 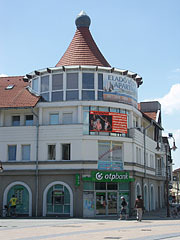 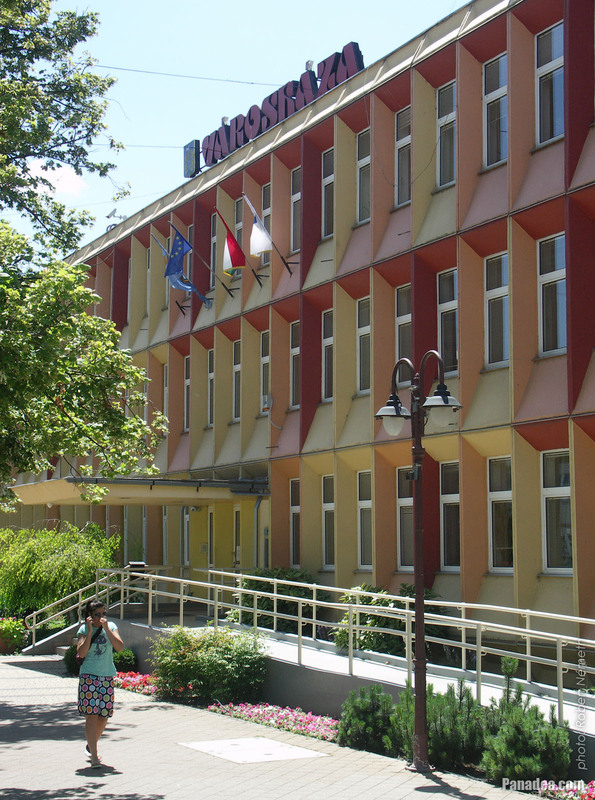 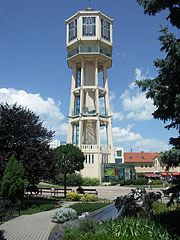 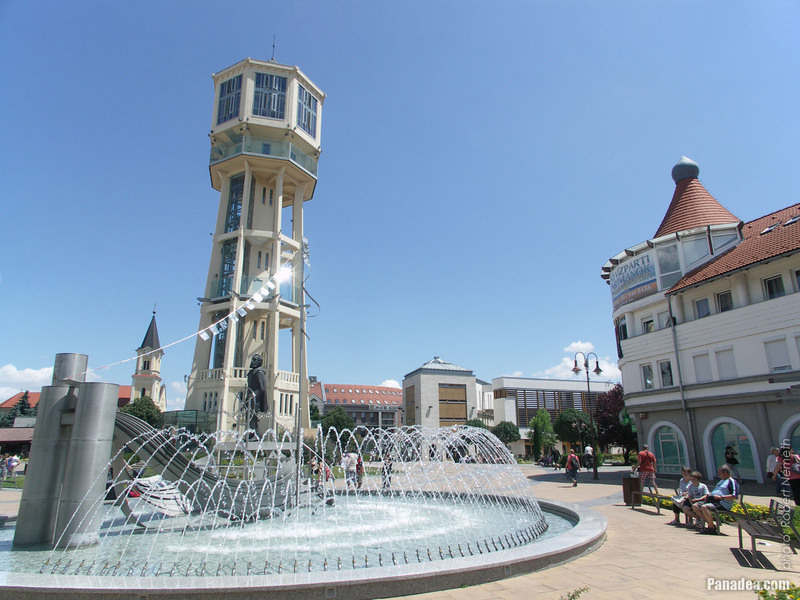 The Water Tower of Siófok is a tourist attraction already since 1980, buit in 2012 it was completely renewed and changed. 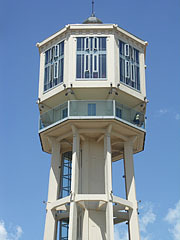 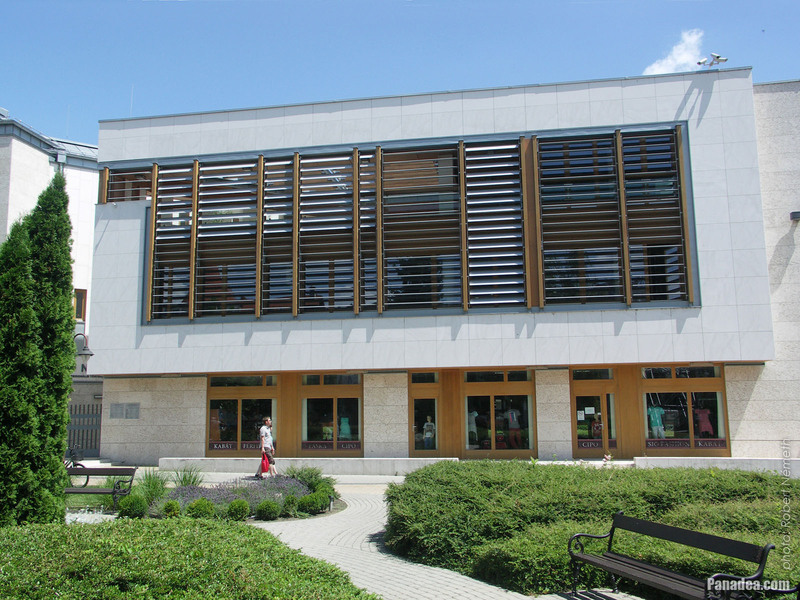 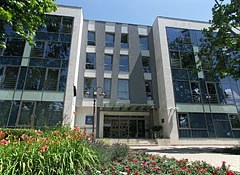 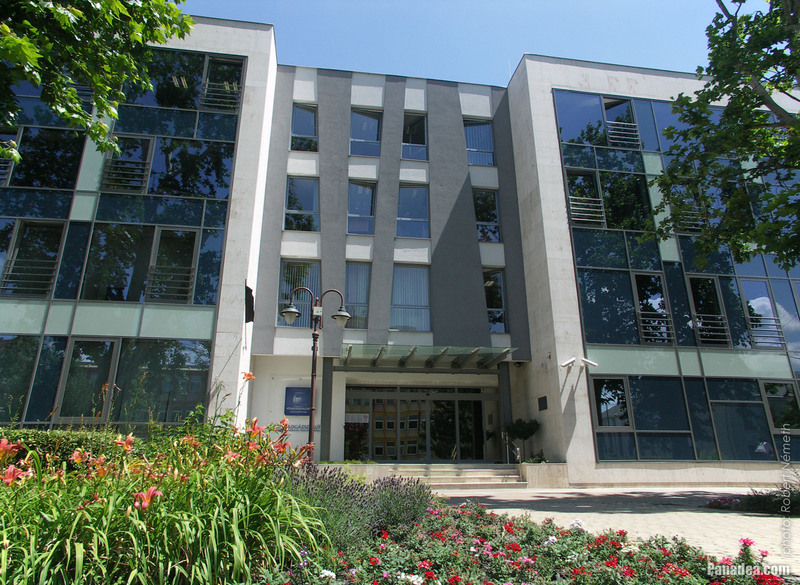 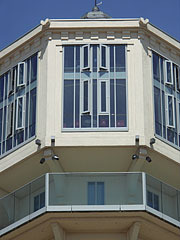 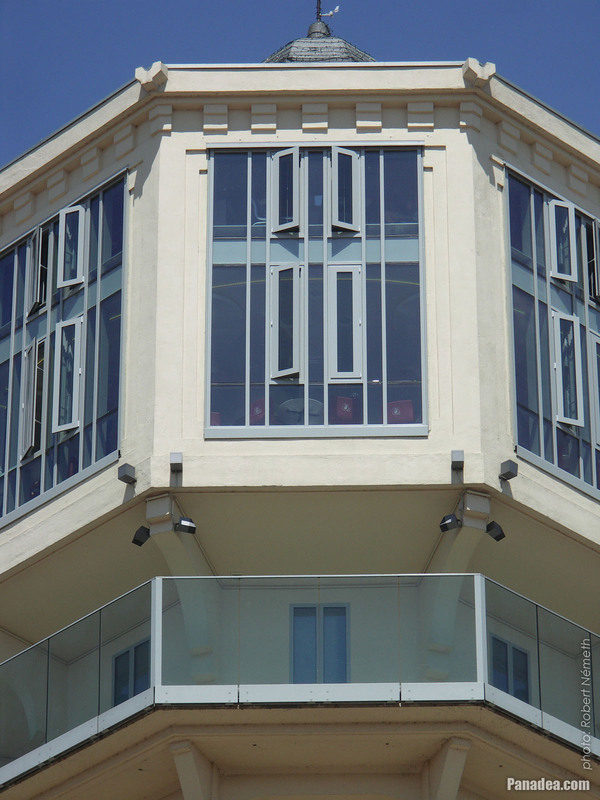 The building is now equipped with large windows and two panoramic elevators. 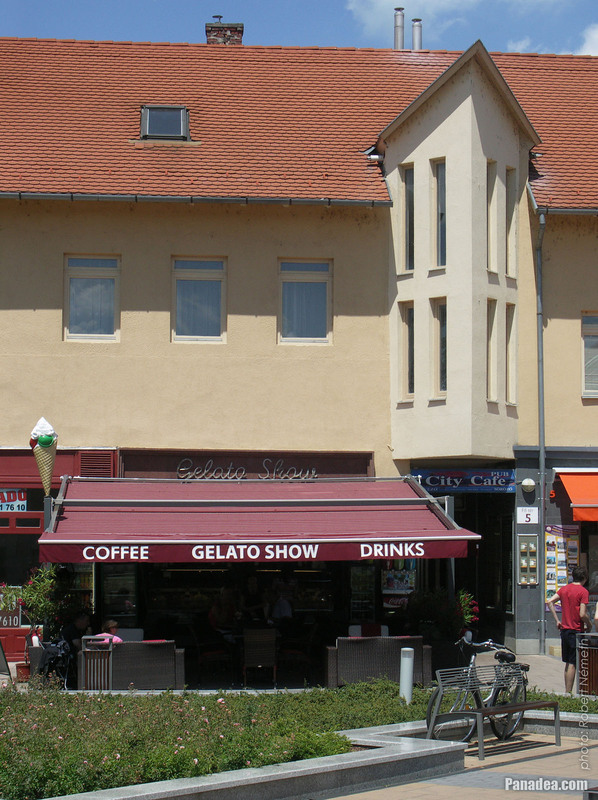 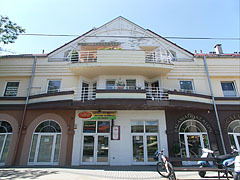 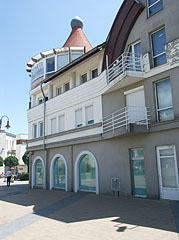 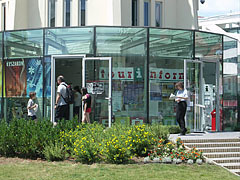 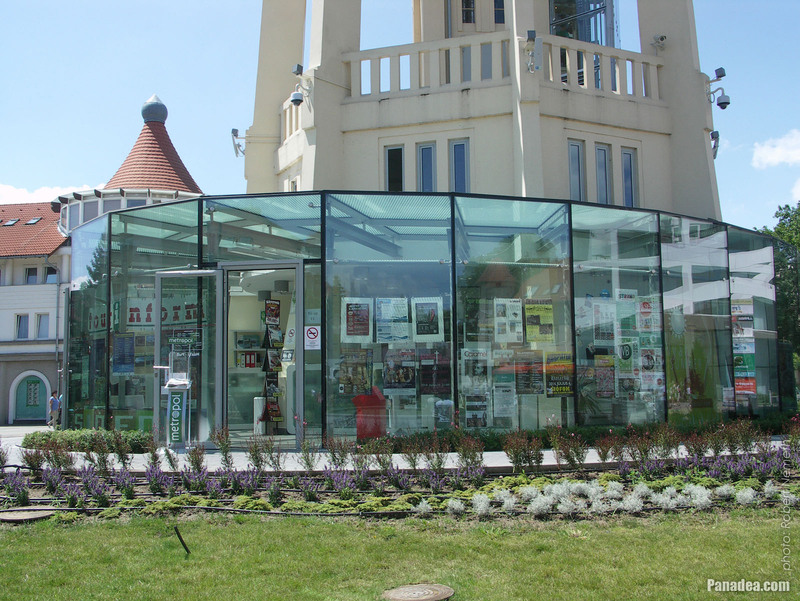 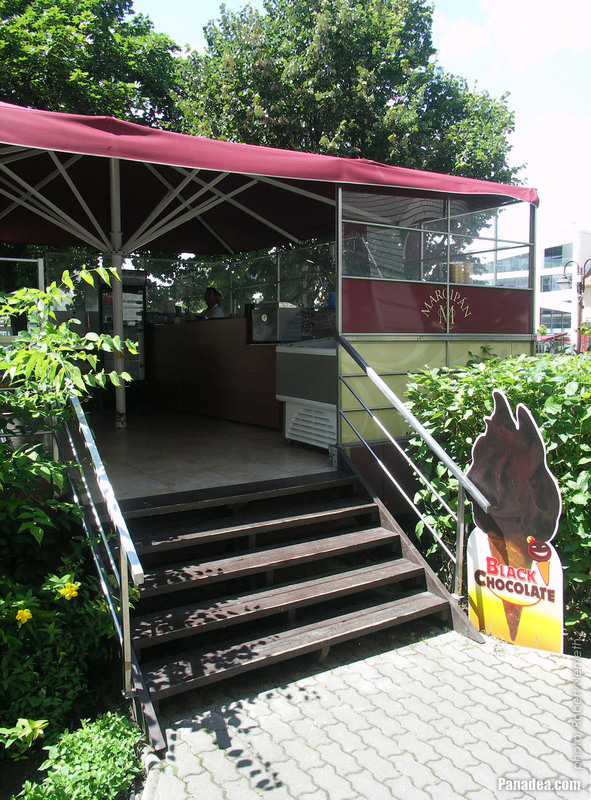 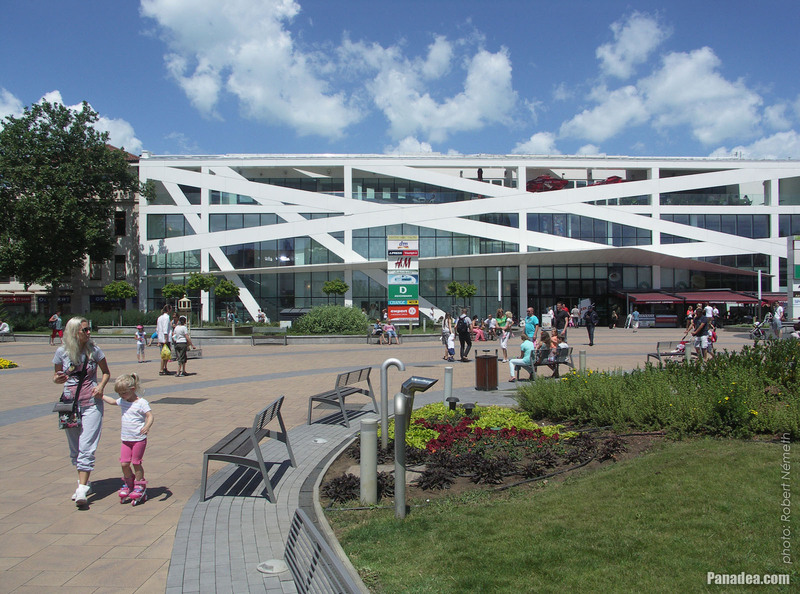 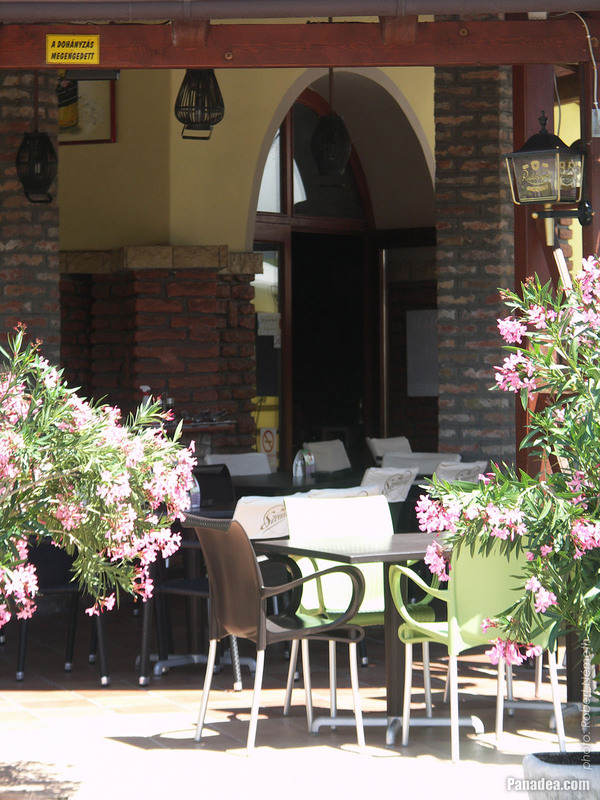 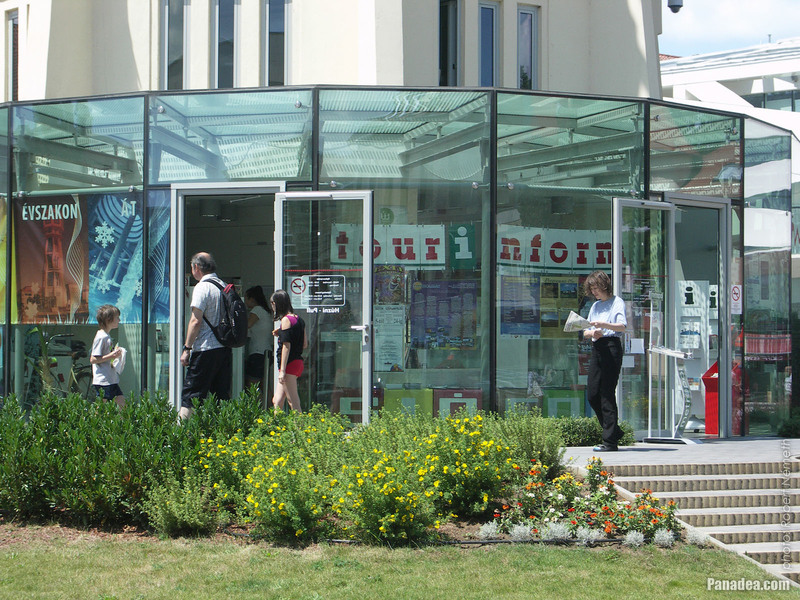 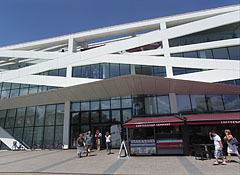 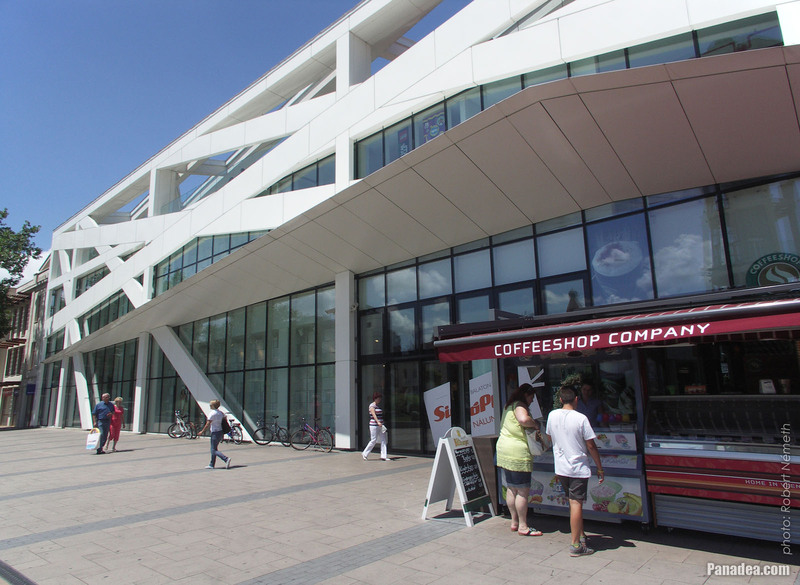 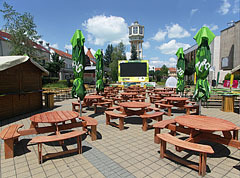 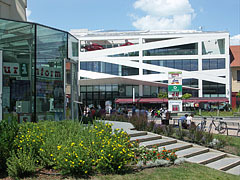 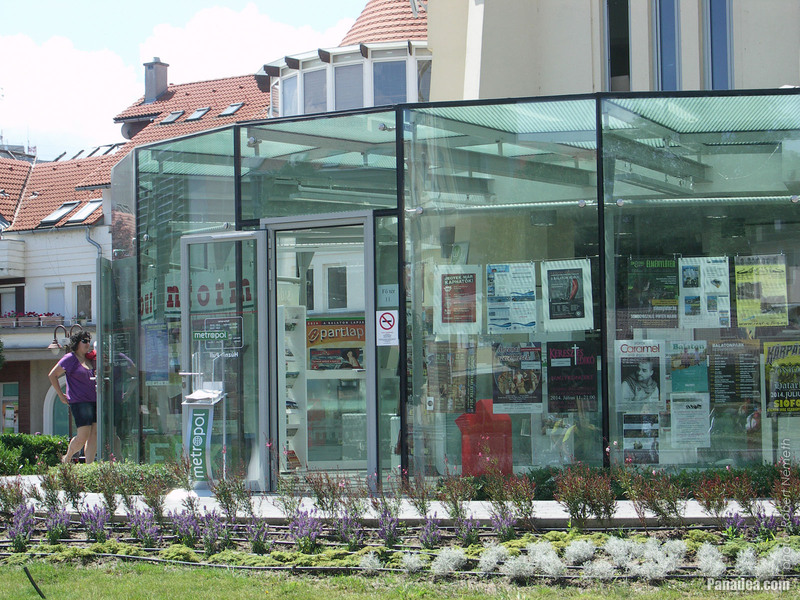 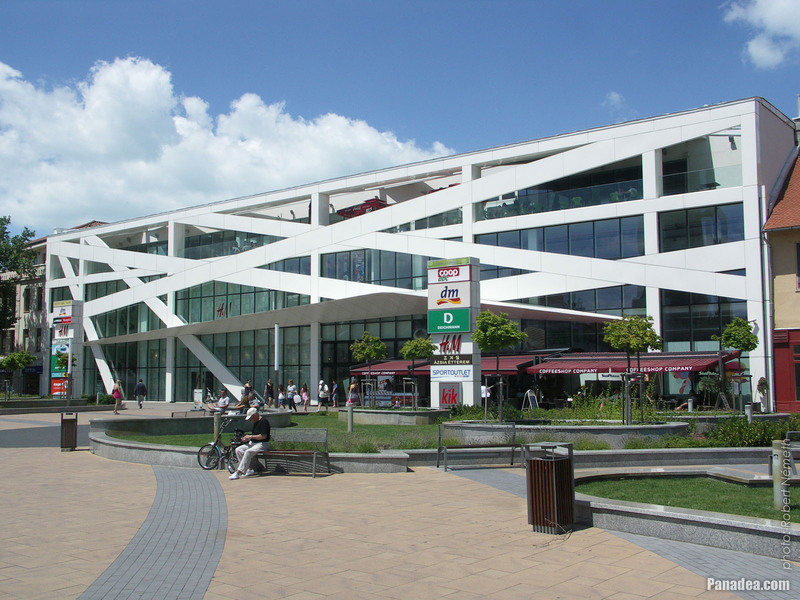 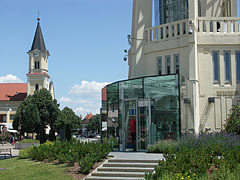 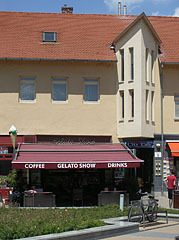 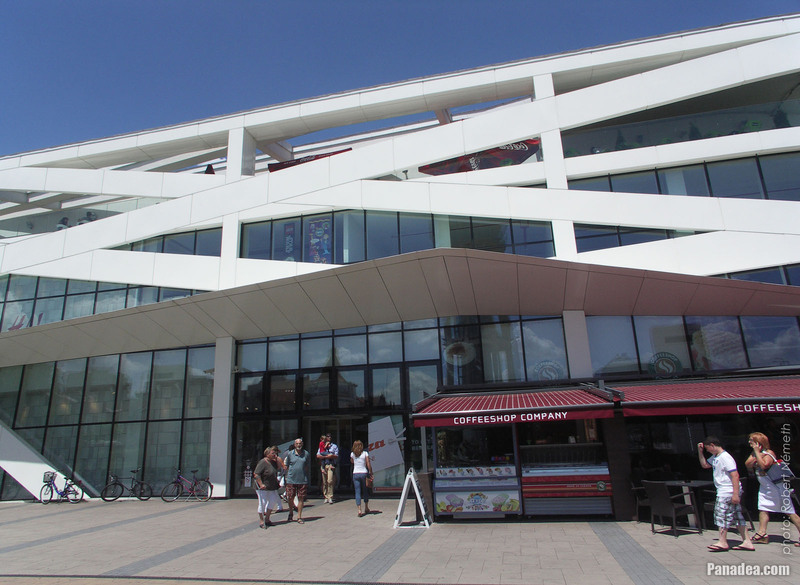 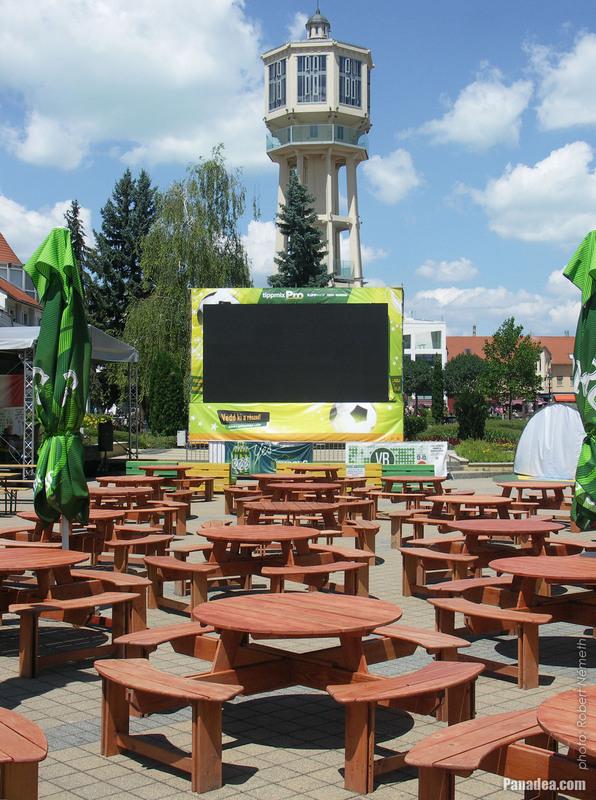 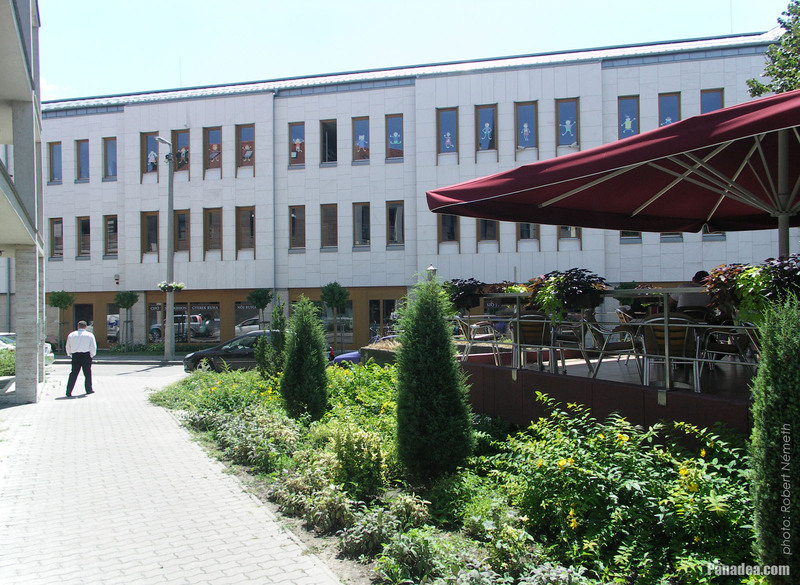 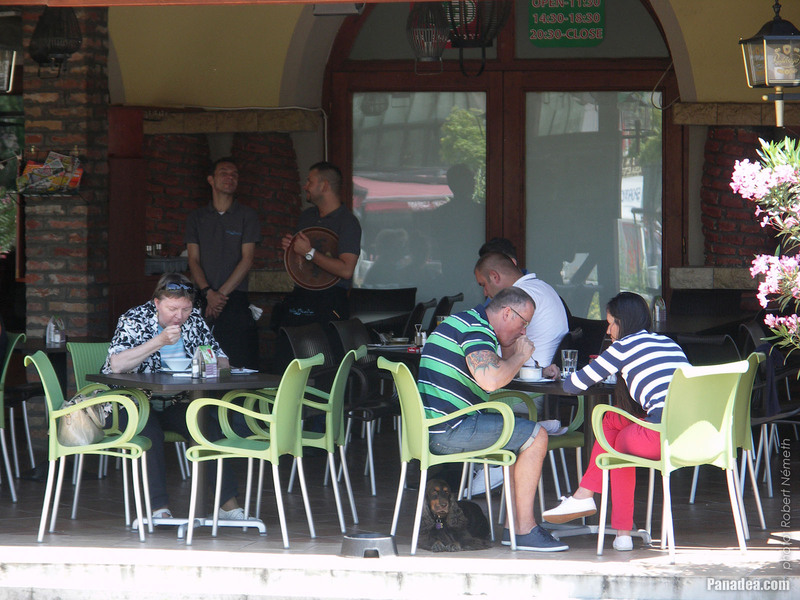 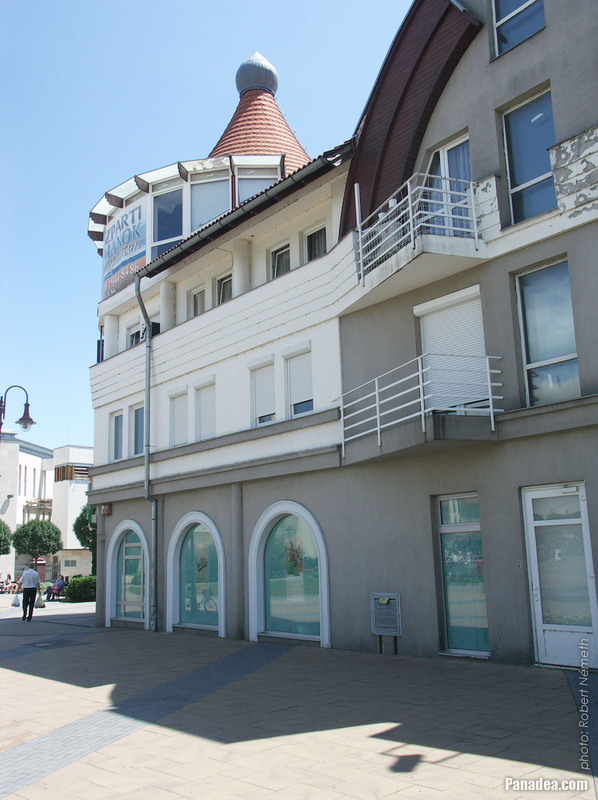 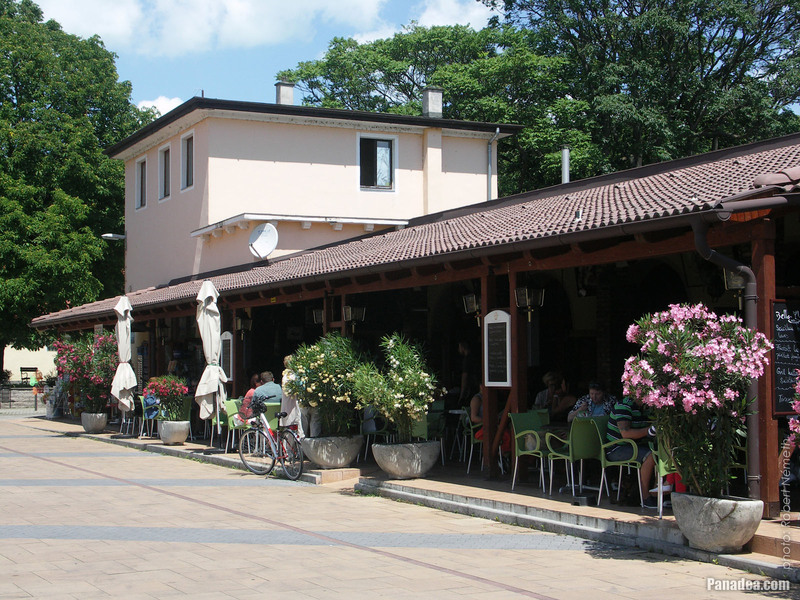 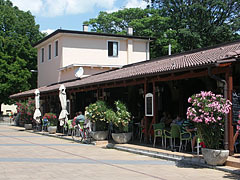 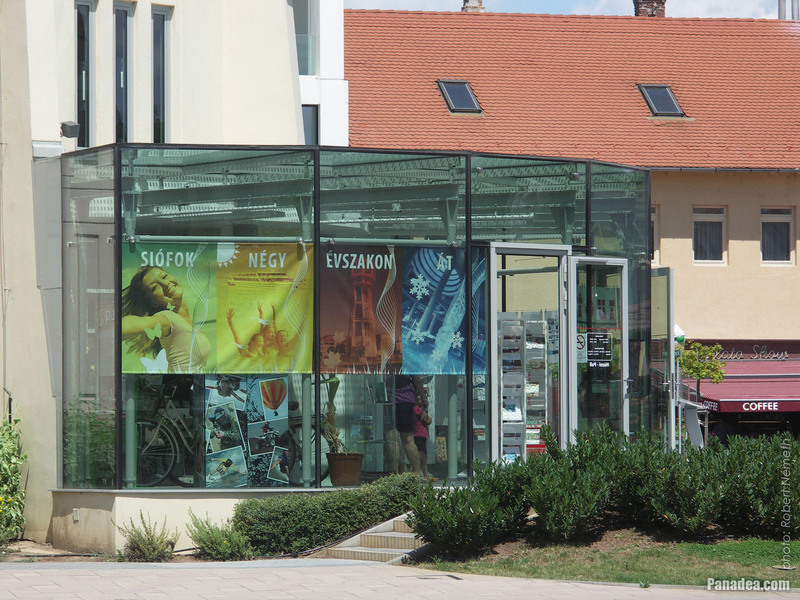 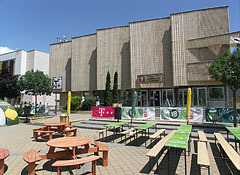 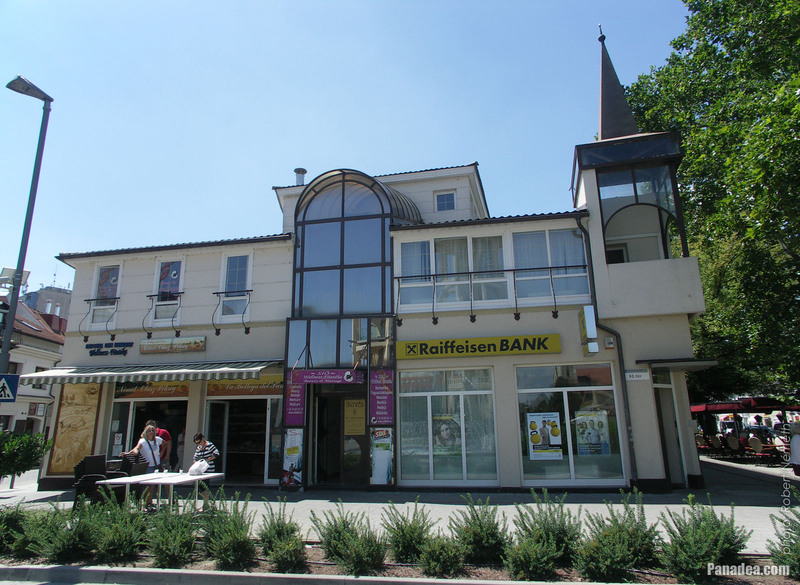 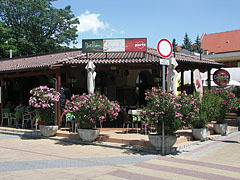 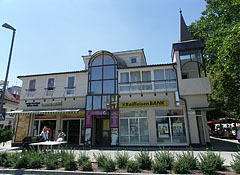 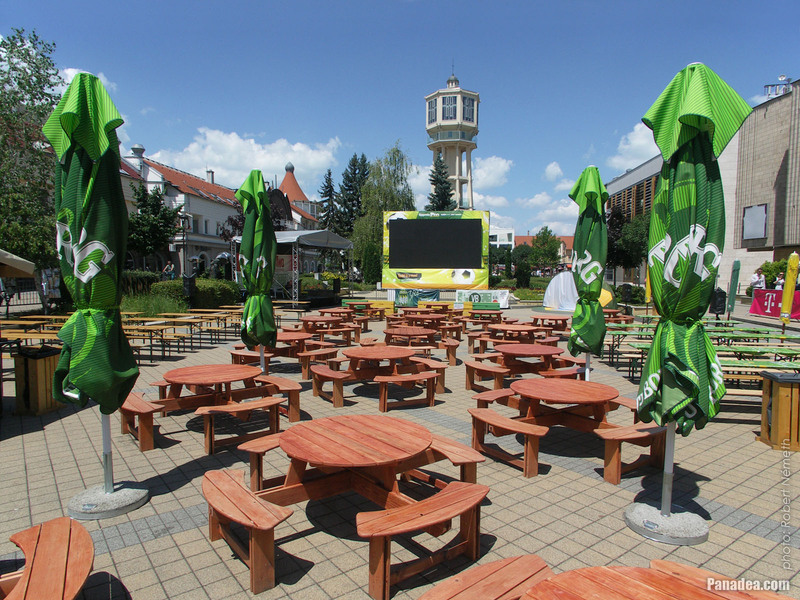 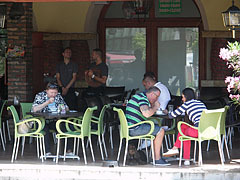 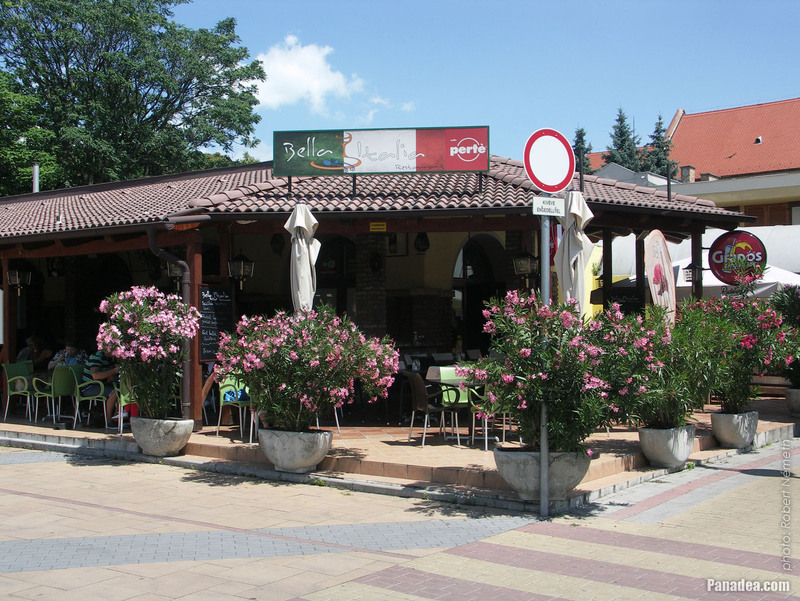 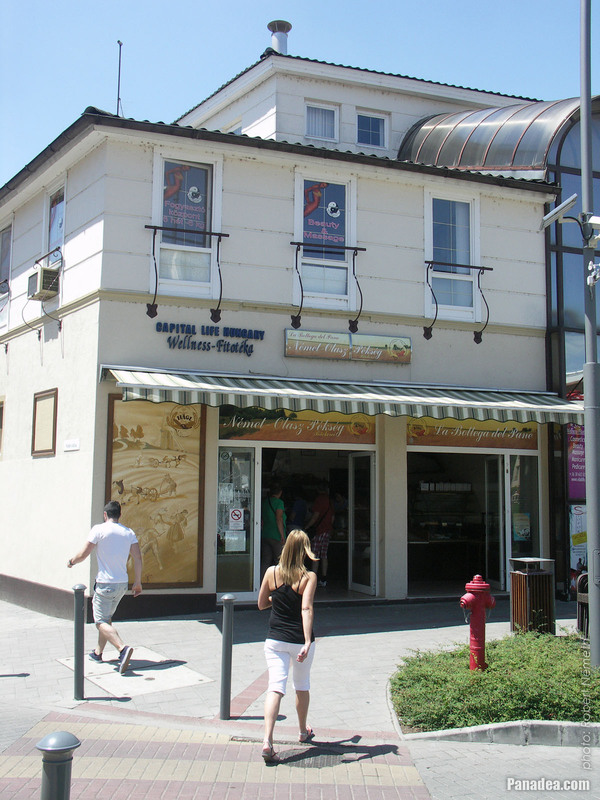 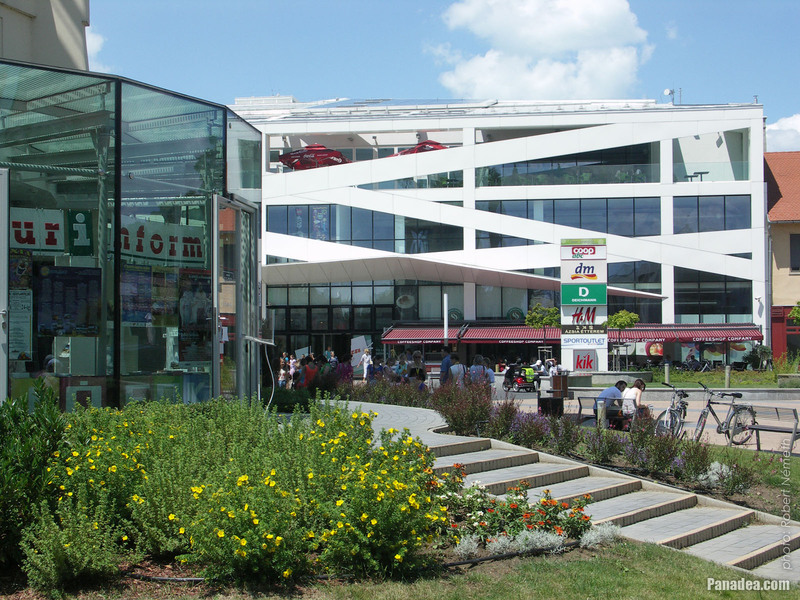 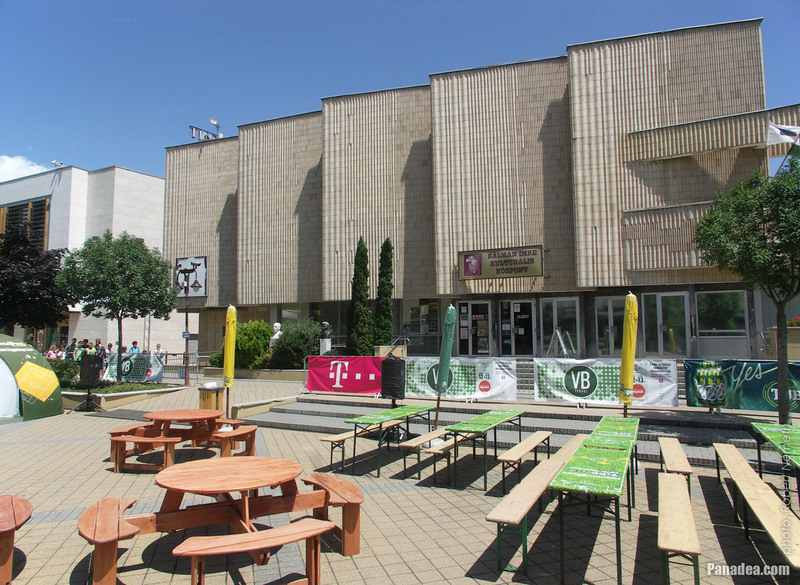 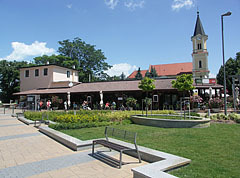 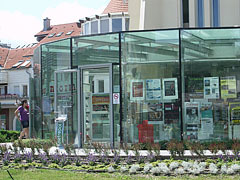 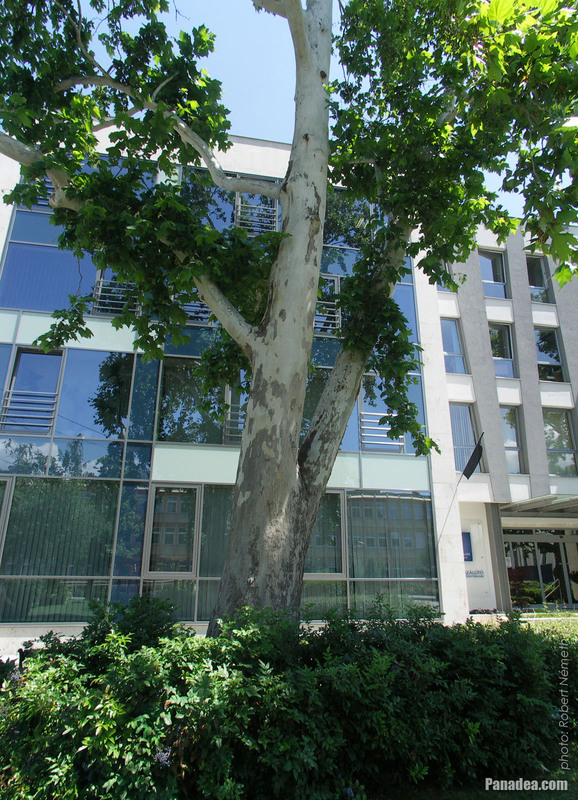 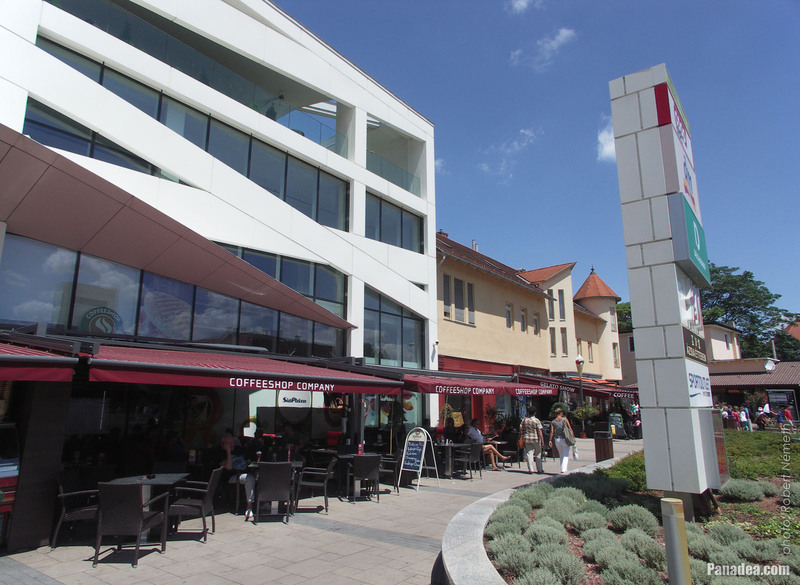 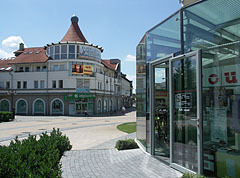 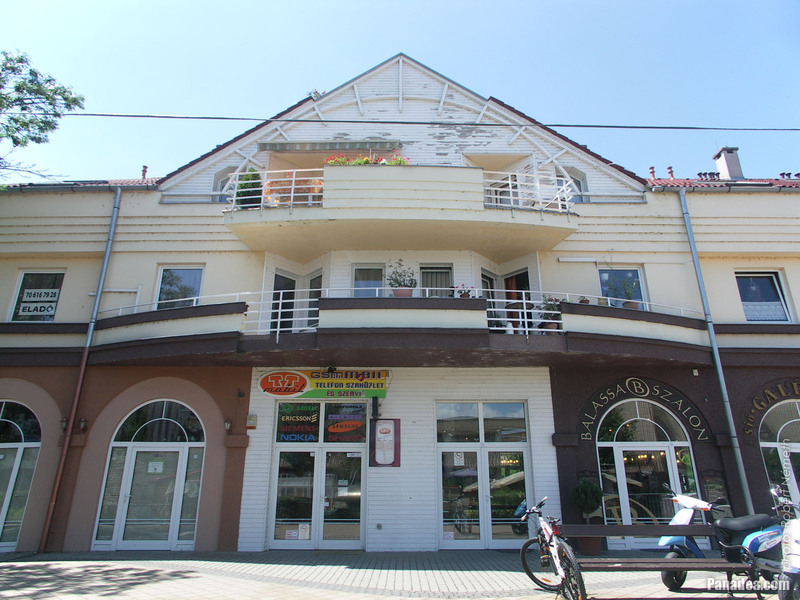 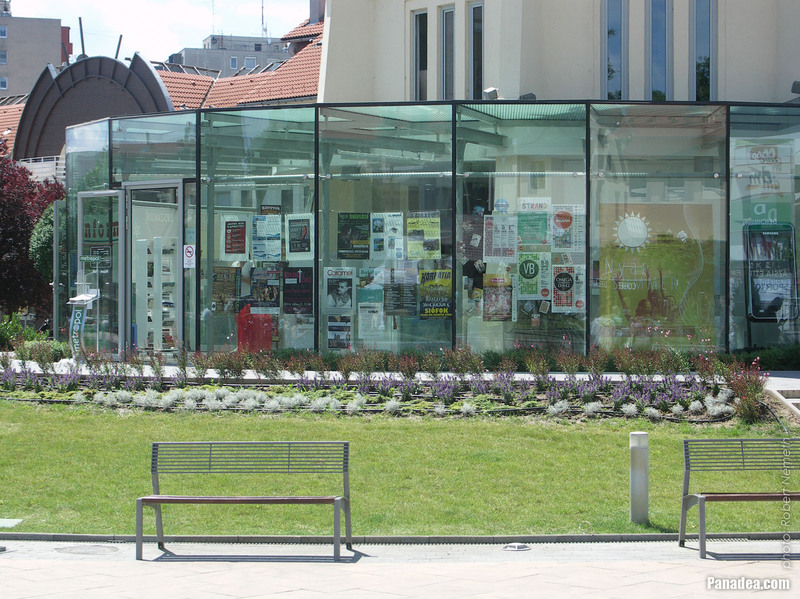 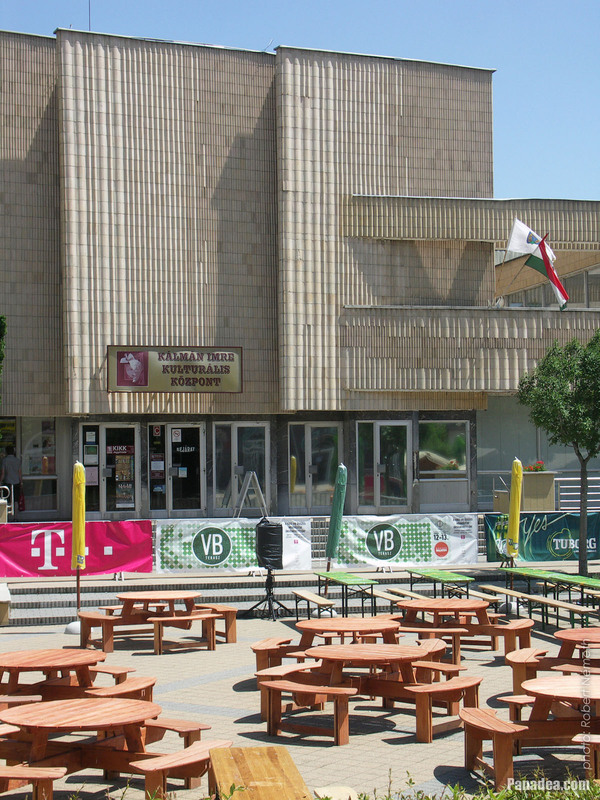 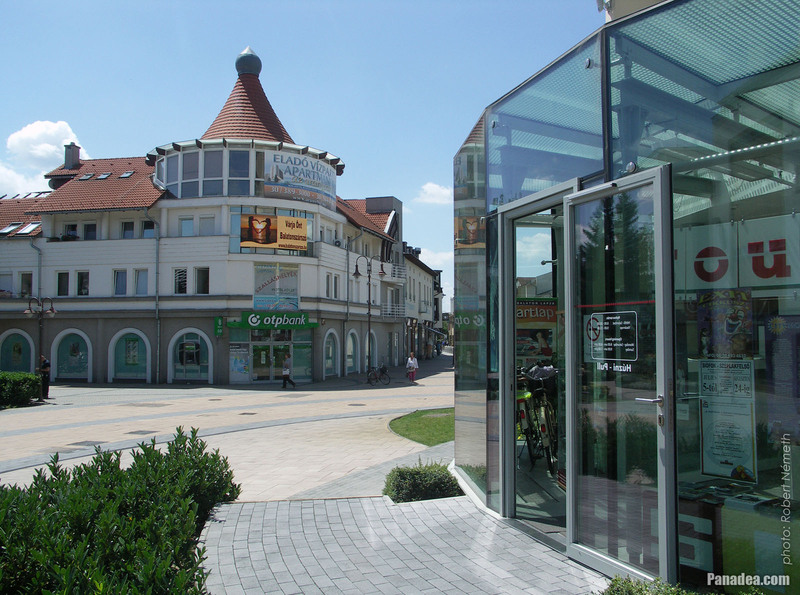 There is a "Tourinform" (tourist information) office at the foot of the tower, as well as its upper part was transformed to a belvedere with lookout or observation point, coffee bar, oxygen bar and a so-called "interactive experience center". 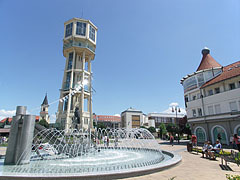 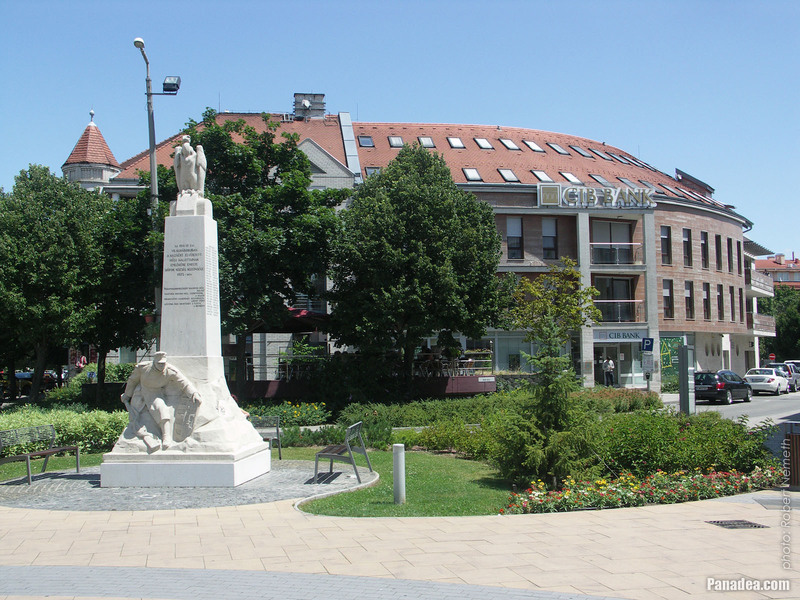 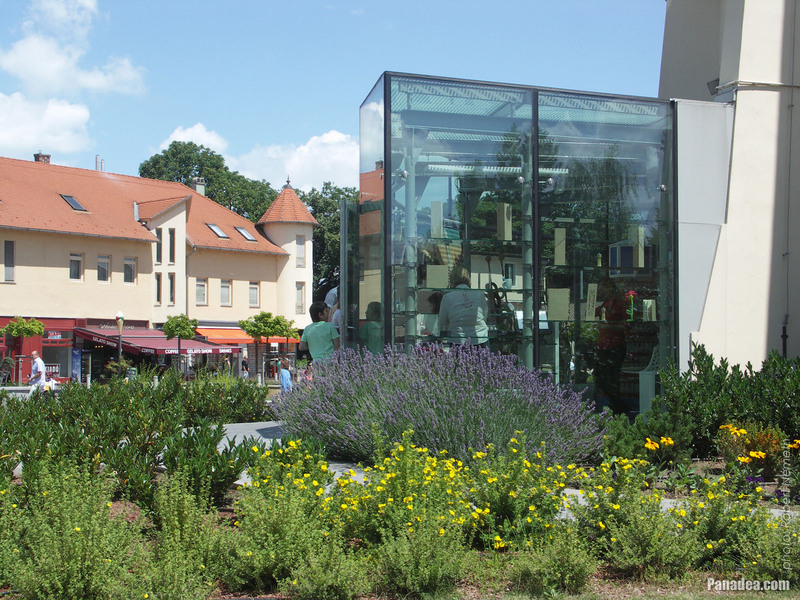 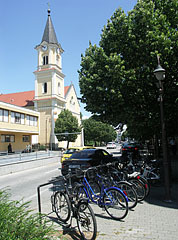 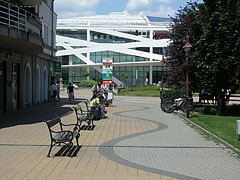 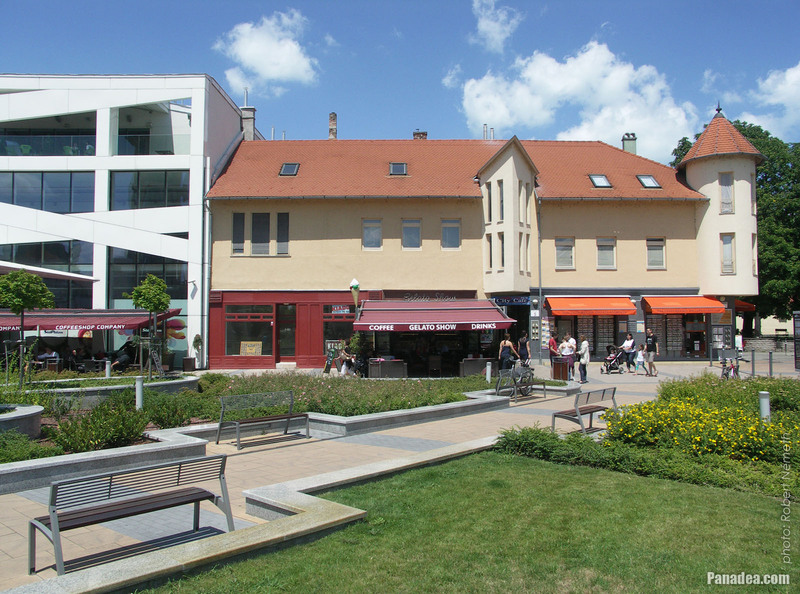 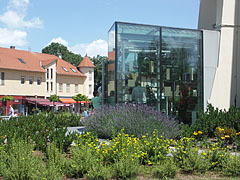 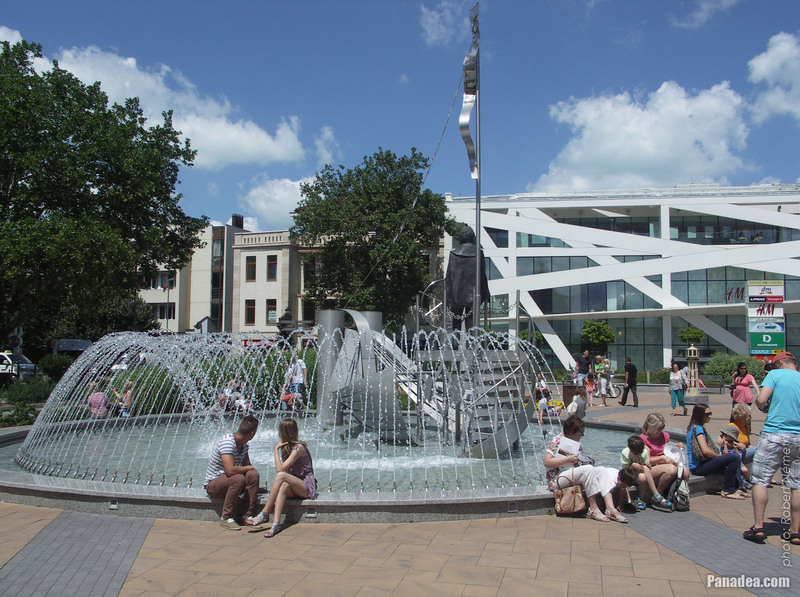 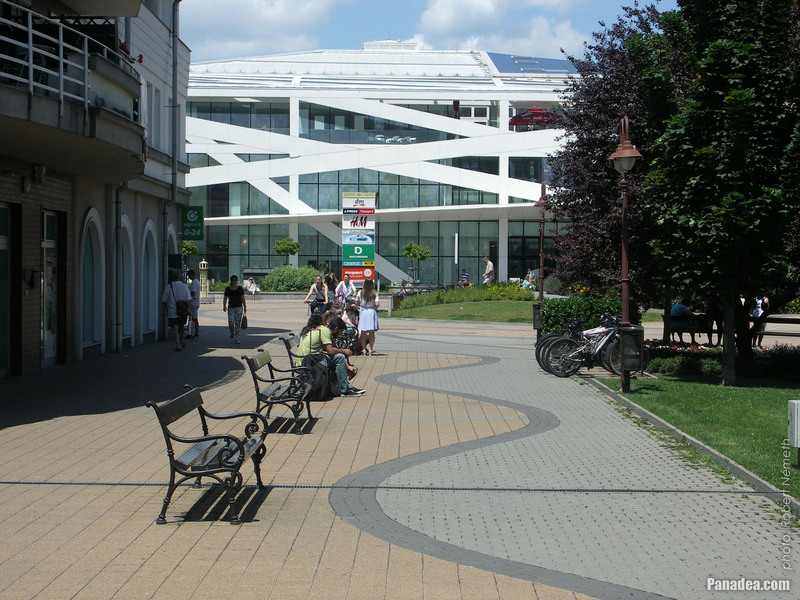 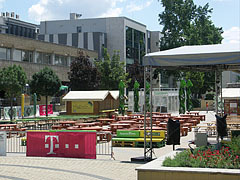 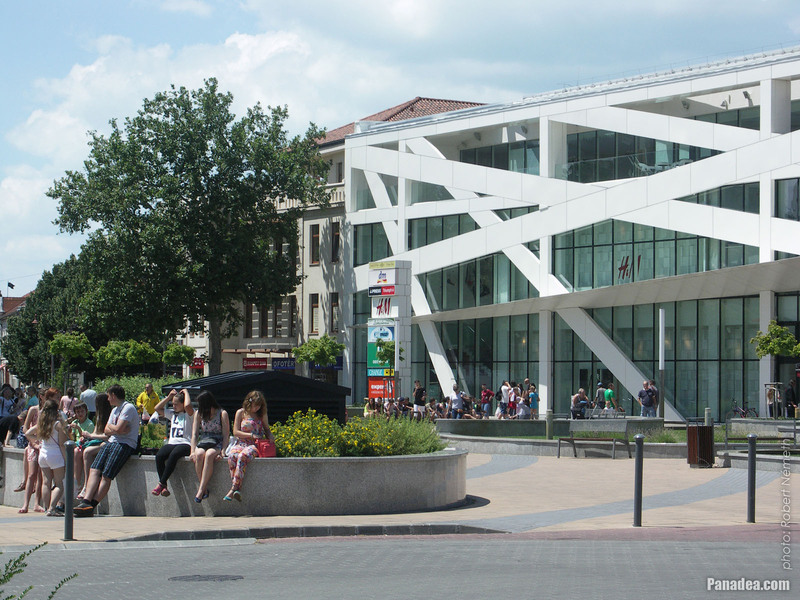 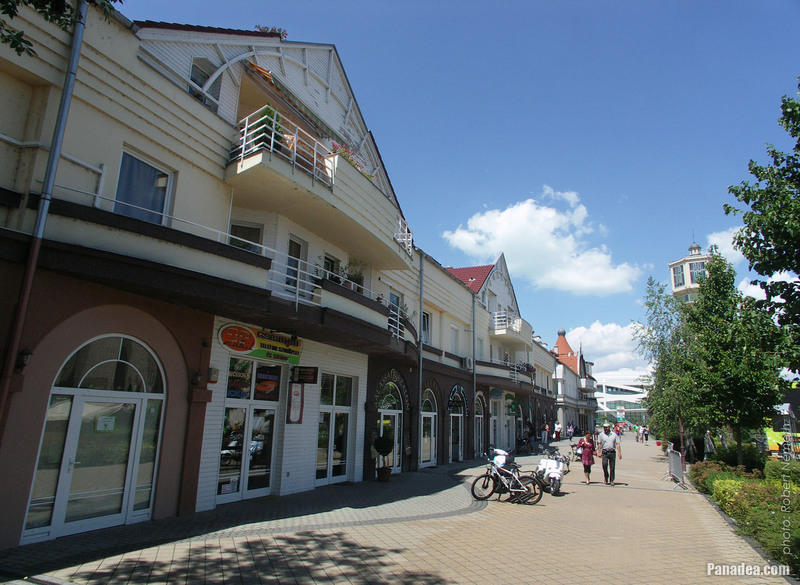 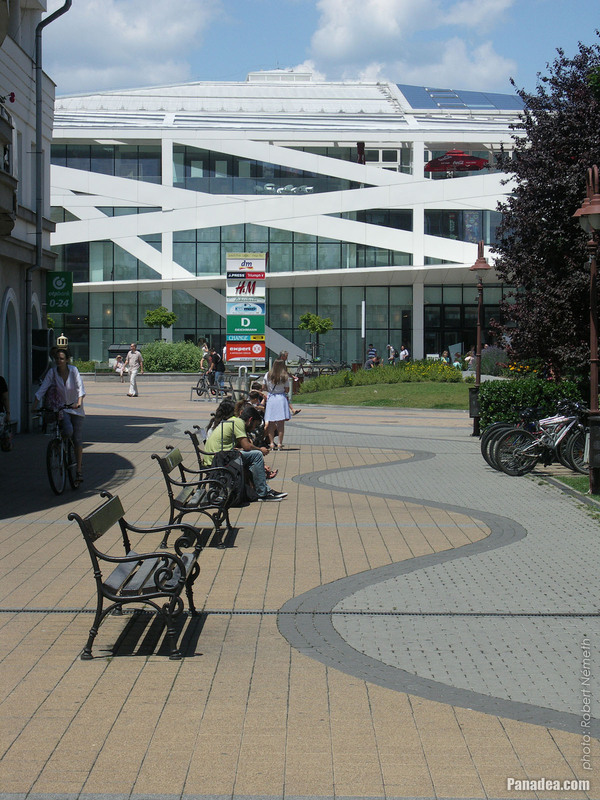 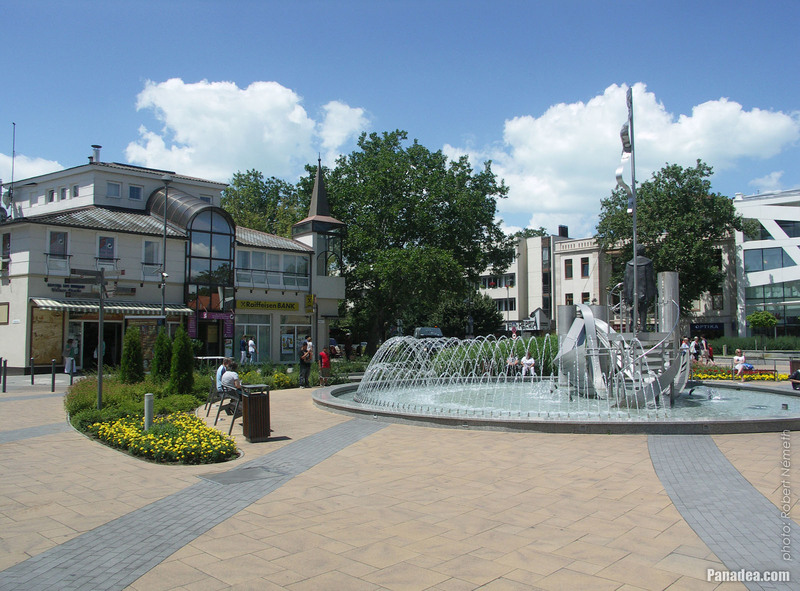 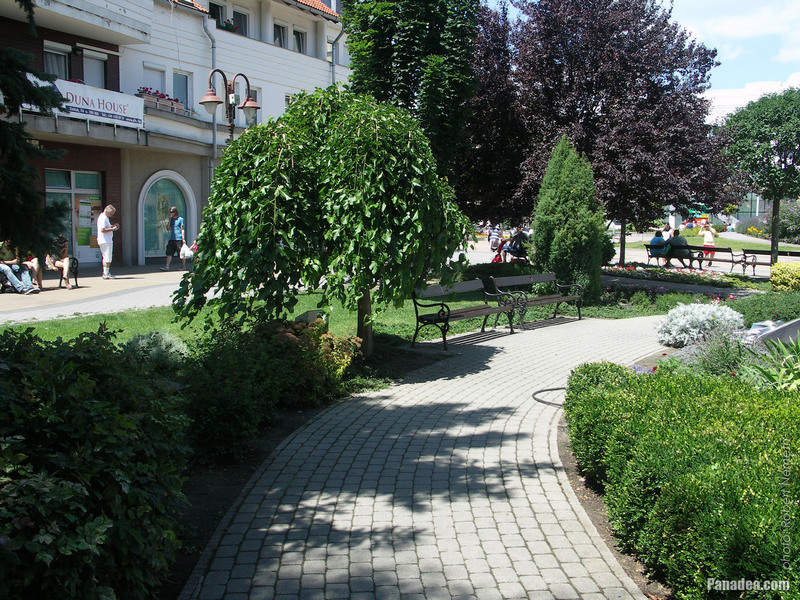 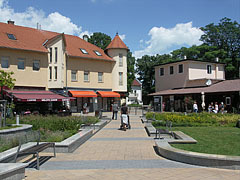 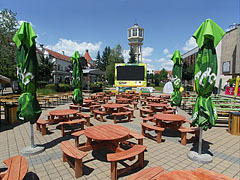 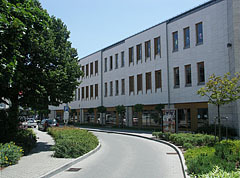 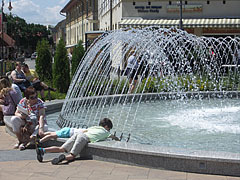 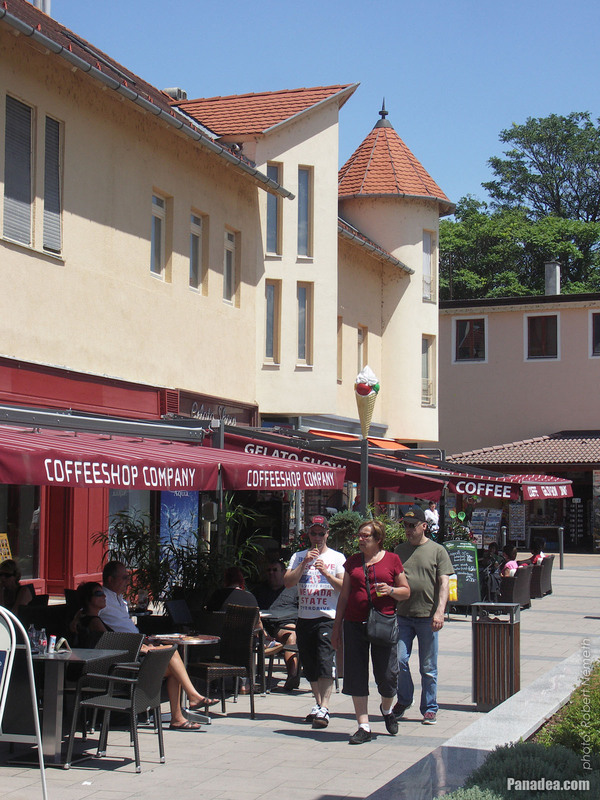 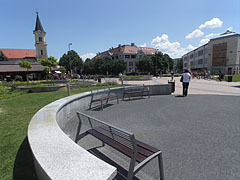 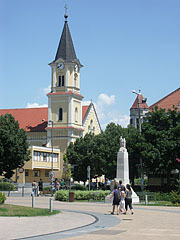 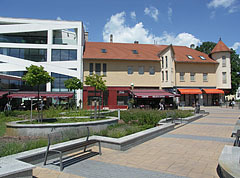 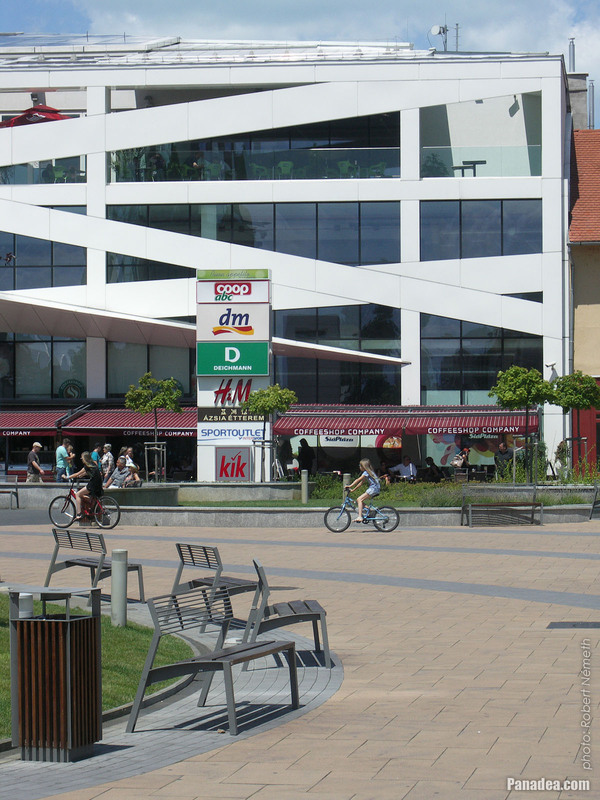 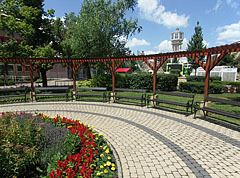 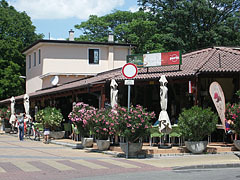 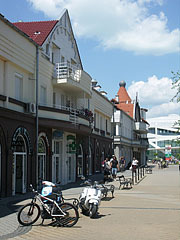 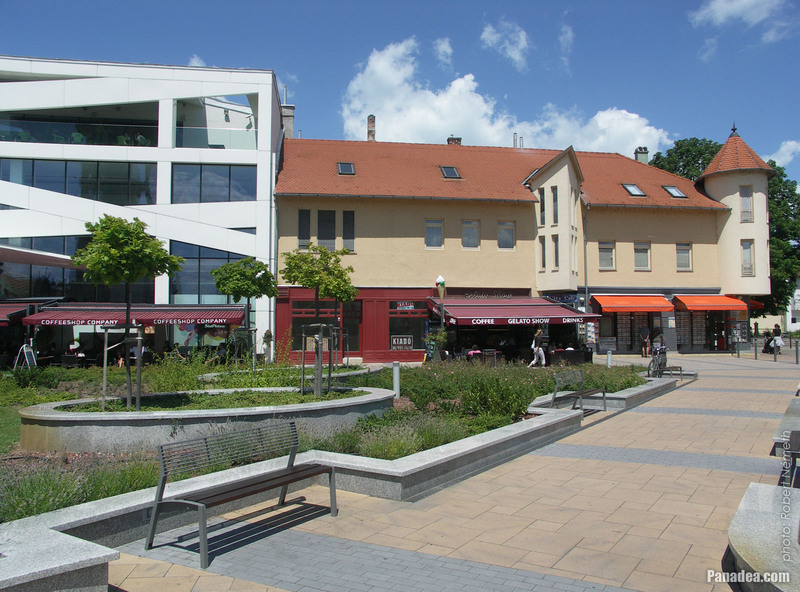 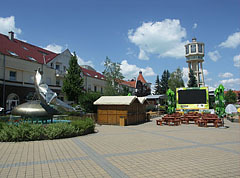 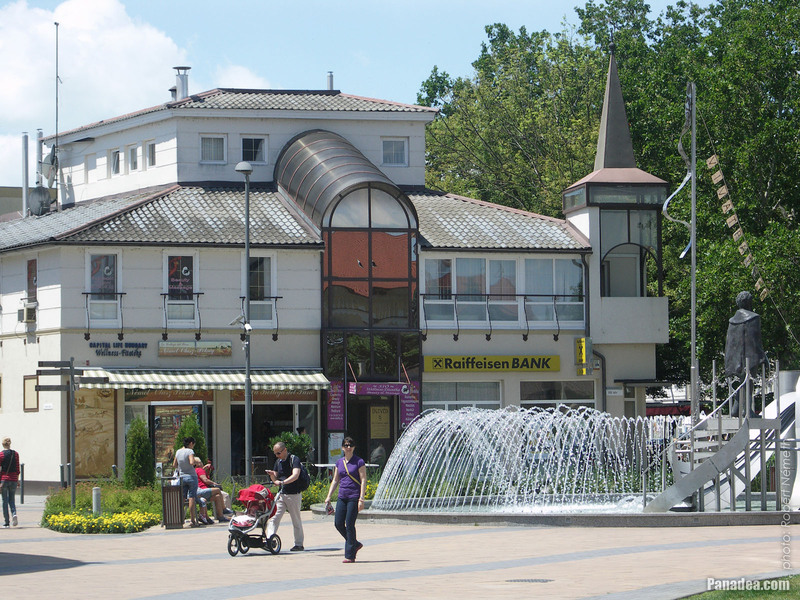 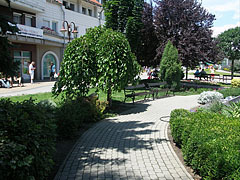 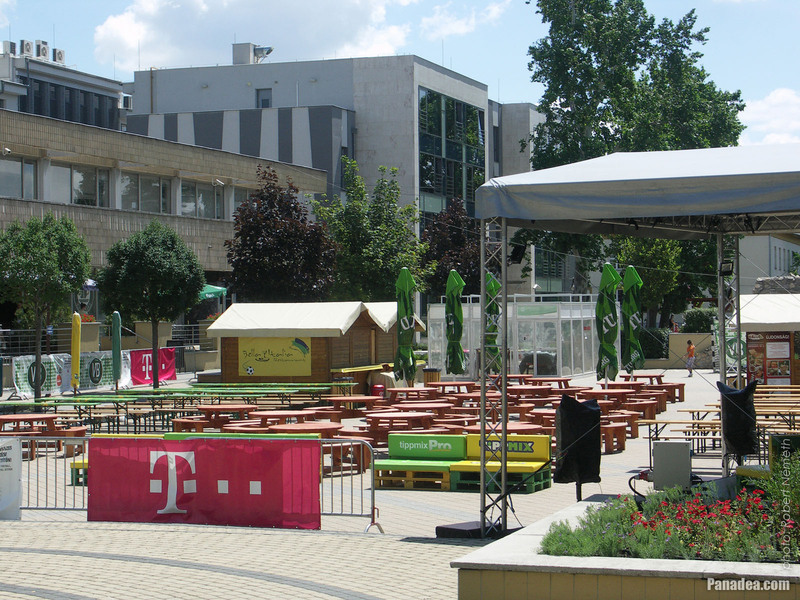 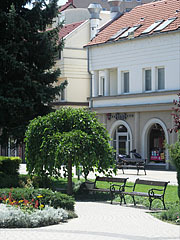 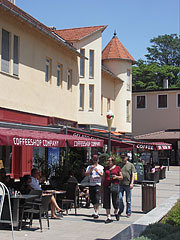 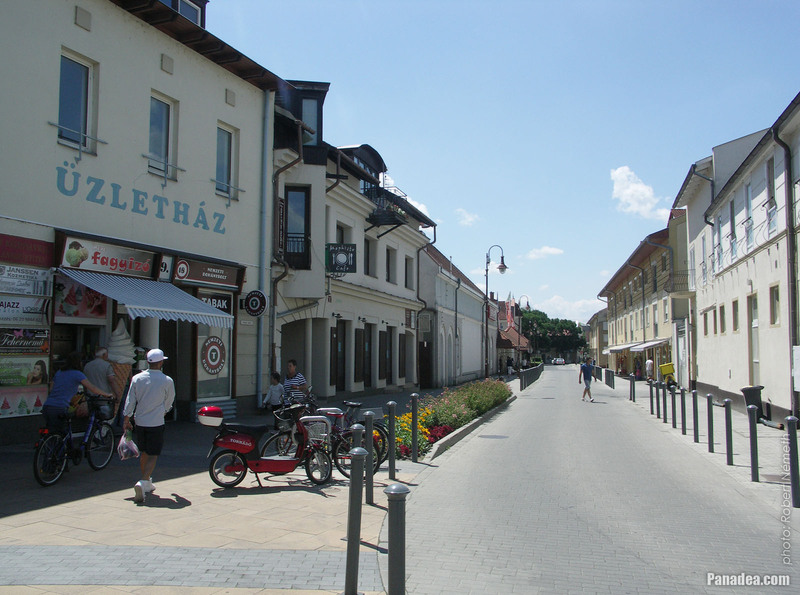 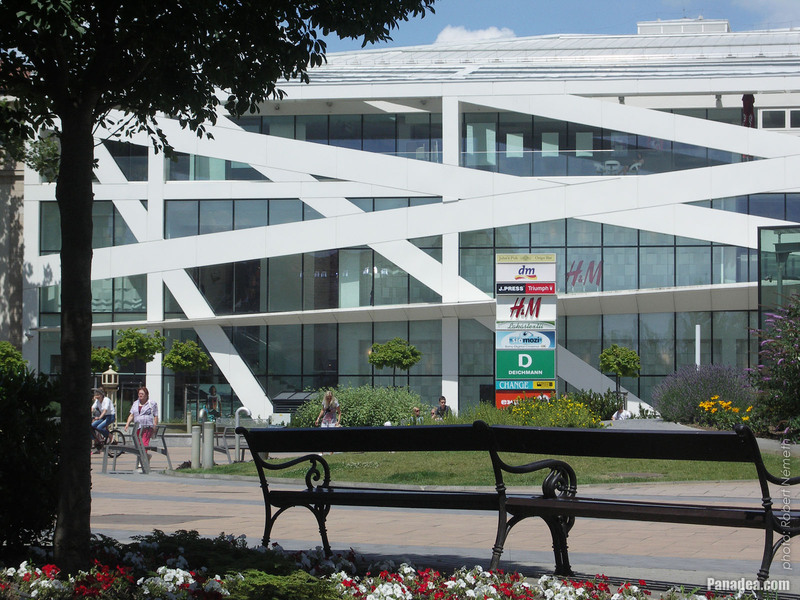 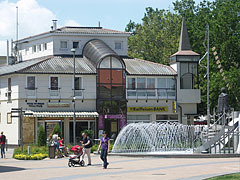 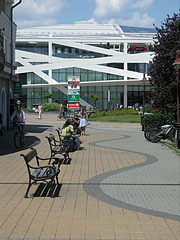 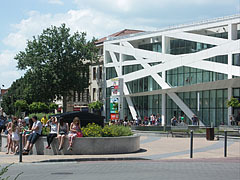 Together with the water tower the surrounding squares were also embellished, the car traffic was diverted and a modernistic pedestrian zone was created. 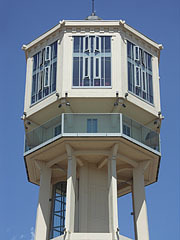 The lookout tower (former water tower) has now three storeys on its top. 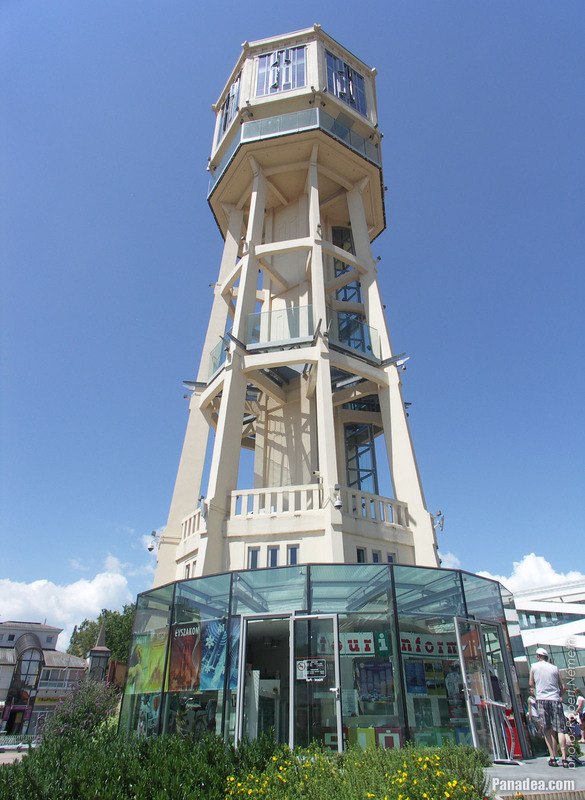 The opened circular terrace is at 27 meters high, and the Panorama Lookout is located another 3 meters higher (this level includes the Szentkirályi Oxygen Bar). 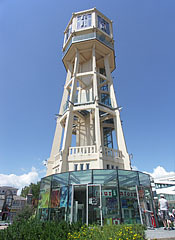 The uppermost level has a so-called interactive entertainment center, its floor is at about 34 meters above the street level.